You are currently browsing the category archive for the ‘technology’ category. I was hoping to see her. Any guesses on maximum crew size? So her mission? I’ll let you speculate until the end of this post. By the way, my usage of exotic here comes from my birder’s guide, which defines an exotic bird as one well outside its usual range. 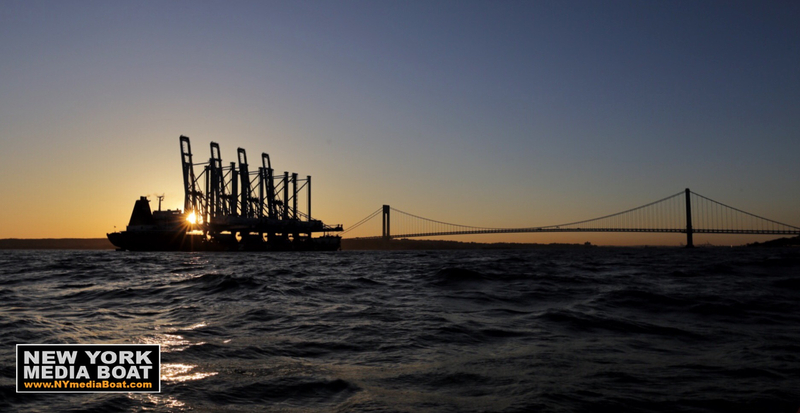 Imagine seeing a penguin in the sixth boro, or encountering a Chinese junk in our harbor; when that does happen, it’s noteworthy. Previous exotic posts can be found here. These two crew rode atop the bridge all the way in . . . see the bright red jacket even on the top photo. Bergen . . . in 1985 I visited there and it’s calling me back. Above . 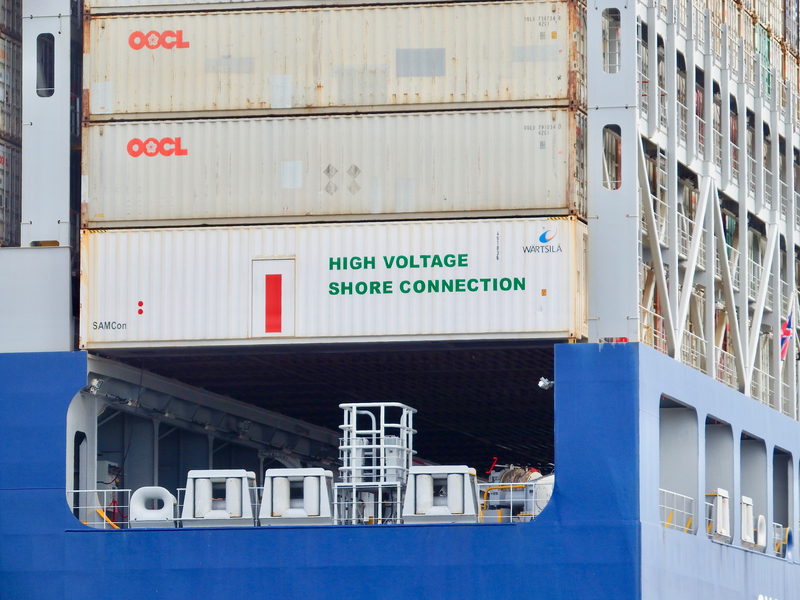 . . no, it’s not a mini-container vessel. 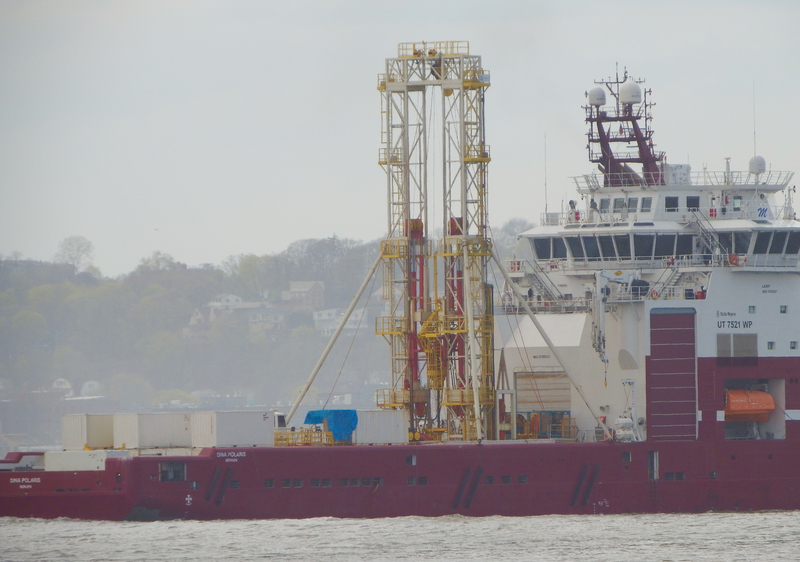 I’m guessing she was core sampling for offshore wind. See the full specs here. 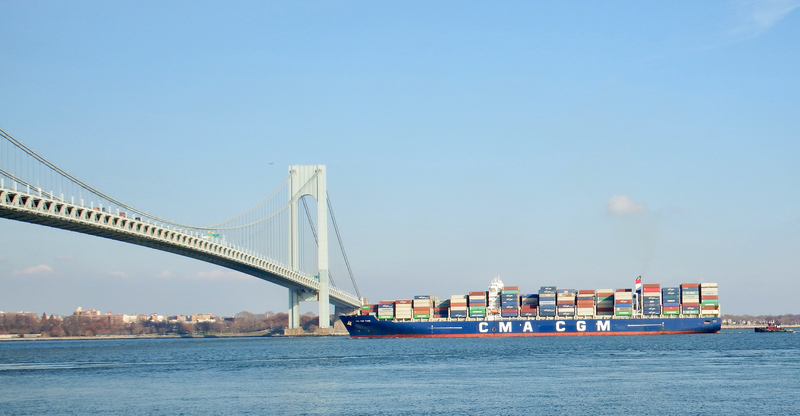 Here’s more on the company, this vessel, and their other vessels. Here’s an article about her from the Times, the Marthas Vineyard Times, that is. She is Turkish-built, 2017, from the Europe side of the Bosphorus. She has berths for 97 crew!! All photos taken by Will Van Dorp, who was happy to sit on my John Travolta bench again . Let’s start with a shot from Oswego. To me, it captures the magic of the Canal in that city and the stately buildings that surround it. The photo is by Jennifer Mays, who calls it “Old man Winter is on his way #headedsouth #oswegocanal. 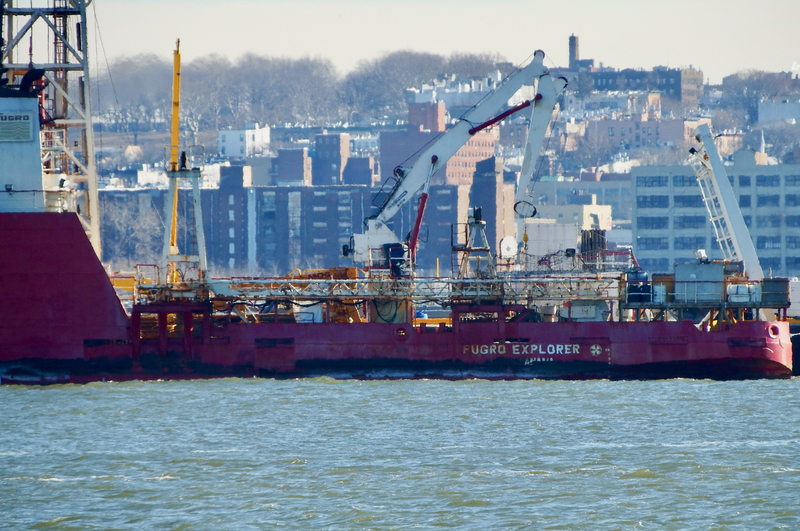 It shows research vessel DelMor (ex-Kaho) upbound in the Oswego Canal between lacks E-8 and E-7. DelMor is in the “canalized” portion of the Oswego River; the wild portion of the river–divided by the ruins of central dock–distinguishes itself by its obvious current. The yellow building farthest left is the 1913 Pontiac Hotel. 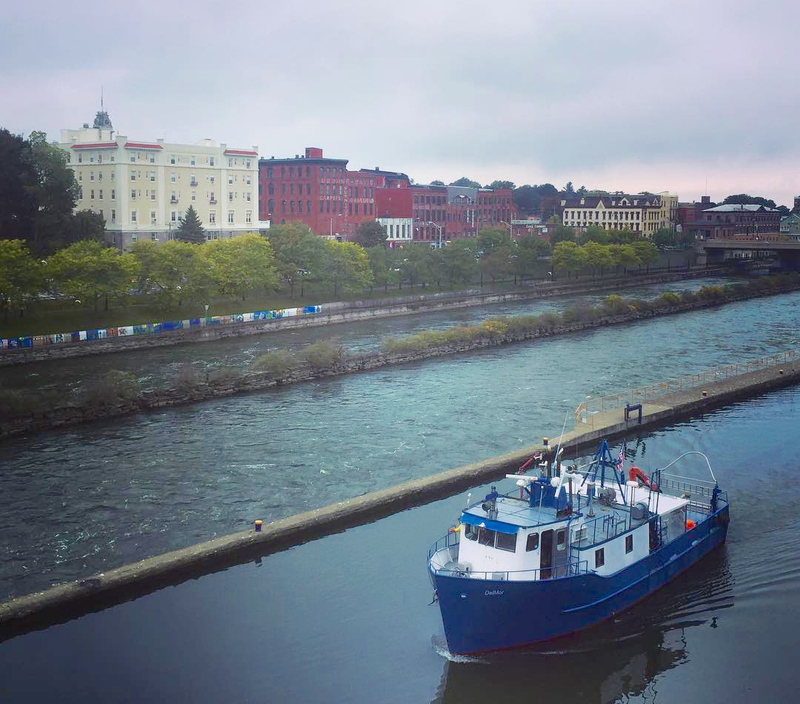 For more sights along the Oswego Canal, click here. Pontiac, the Odawa leader of his confederacy post-French & Indian War, signed a peace treaty in Oswego in July 1766. The next two photos come from Patrick Gallagher. 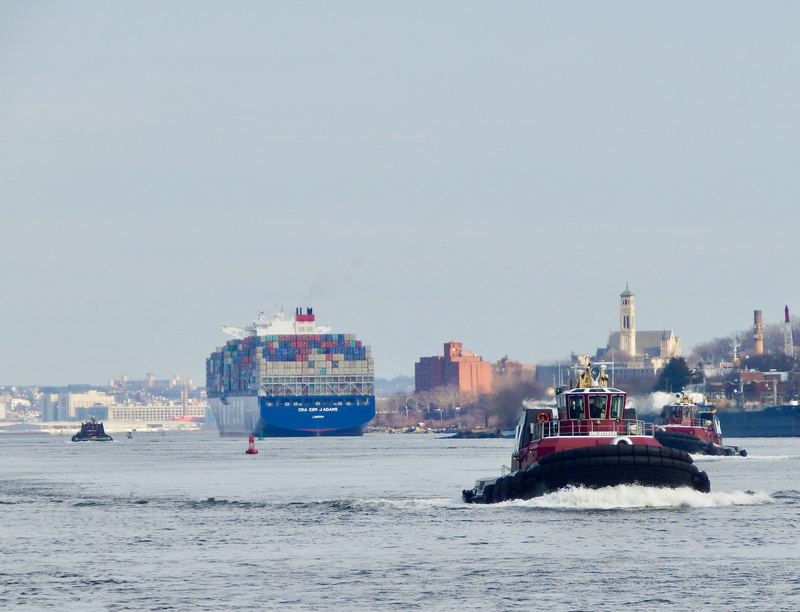 The shots taken from the East River show the Brooklyn Bridge and Clipper City beyond that. The colors are the magic of sunset as recorded by a smartphone camera. 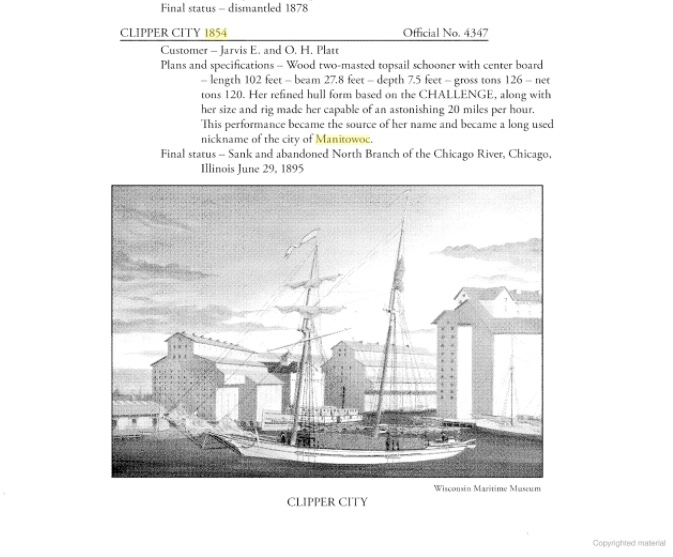 Clipper City is a 158′ replica of a Great Lakes schooner built in Manitowoc in 1854. 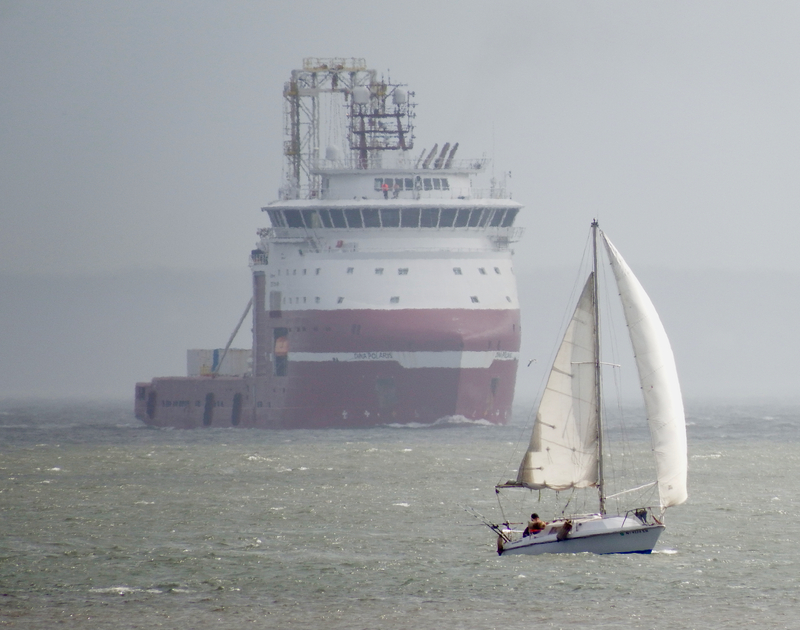 The image below comes from the must-have book The Freighters of Manitowoc by Tom Wenstadt. 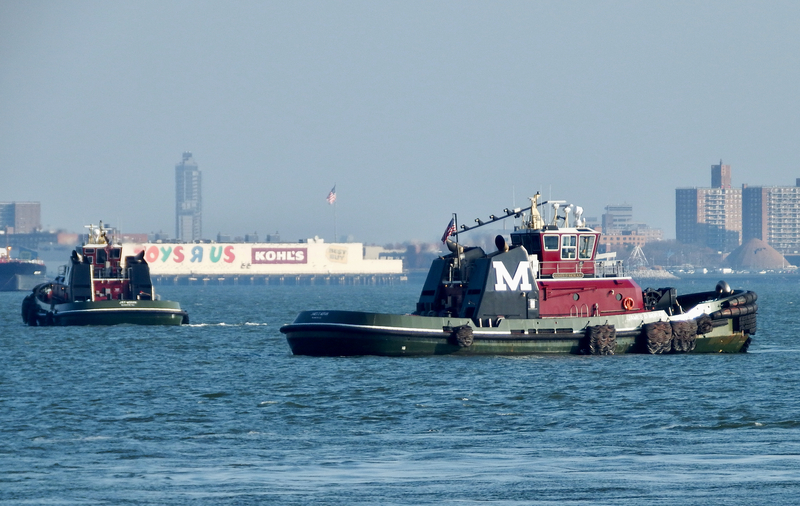 And last but certainly not least, Paul Strubeck got a close-up photo of a newcomer in the sixth boro, a floating electronic billboard created by Ballyhoo Media. 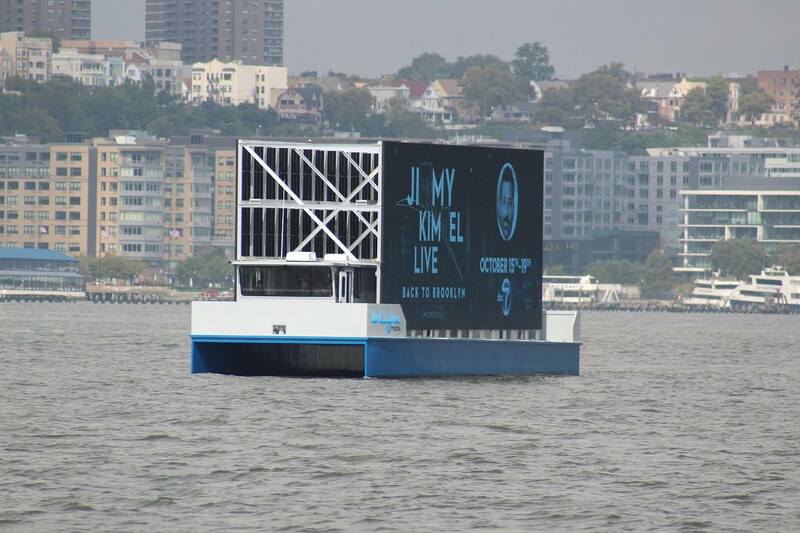 A floating billboard . . . would that be a bill boat? 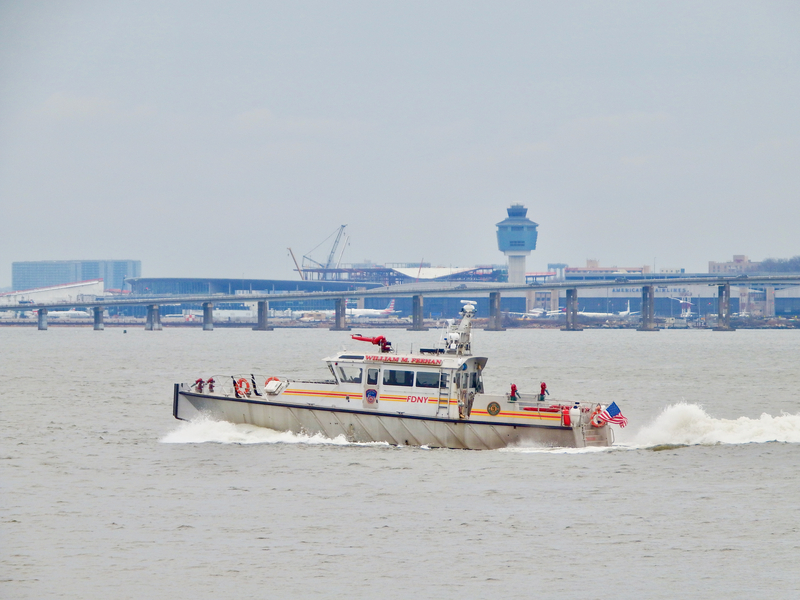 Matt OHara caught the billboat departing Morris Canal, leaving the NJCRR terminal to starboard. If you do FB, you can see a sped-up version of it being built here. Since that shipyard is upriver, it must have escaped detection by river watchers upstream. Glenn? 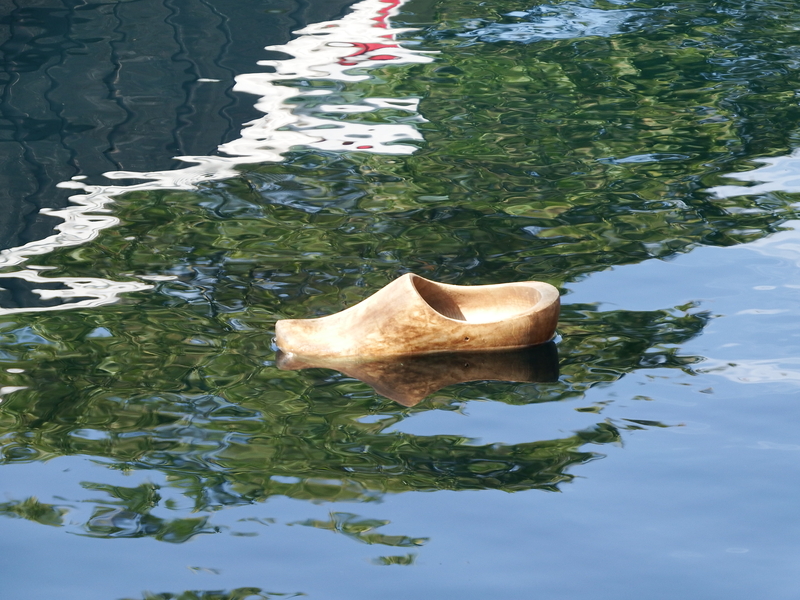 When I saw the billboat Sunday, the image/advert changed every few seconds. 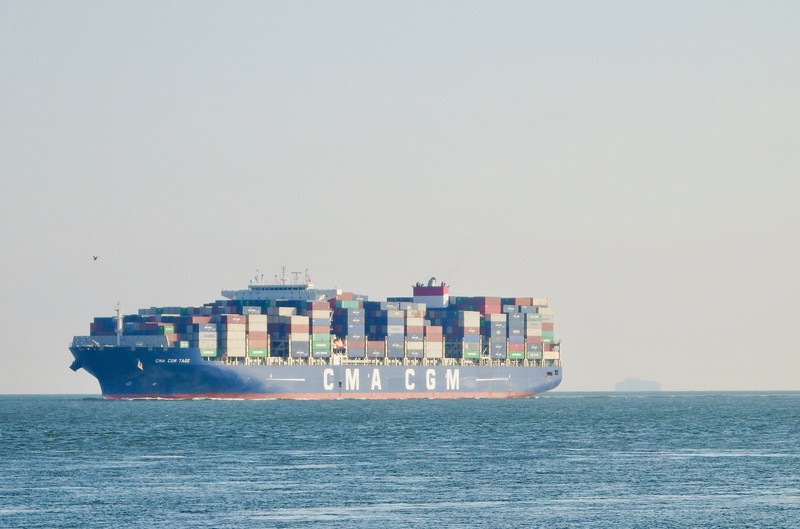 The vessel size is estimated at 72′ . . . with 65′ screens. What’s next . 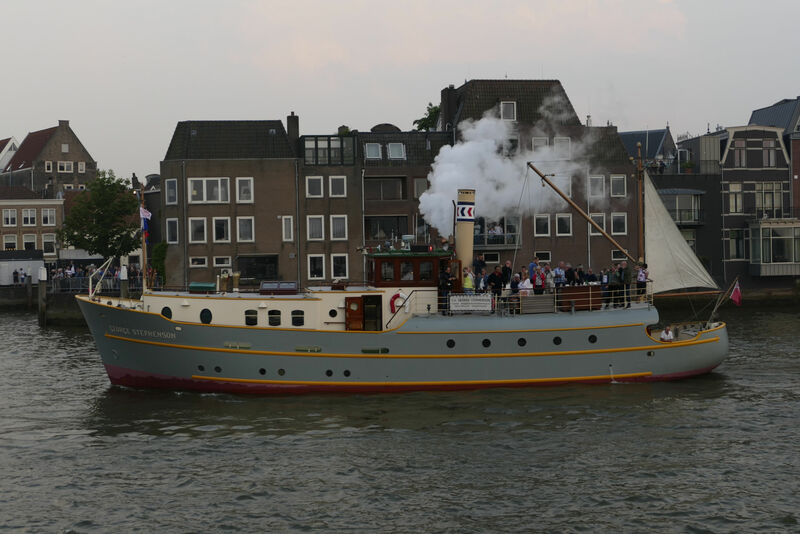 . . a billboat that carries sports events, political debates, feature films, documentaries about the harbor? What else? Many thanks to Jennifer, Patrick, Matt, and Paul for use of these photos. Meanwhile, I’m waiting for a sunny day and for a certain pink-hulled ship called ONE Stork to either arrive or depart in bright daylight. She arrived in the sixth boro and departed again, twice . . . in the dark hours. Here was the first in this series. Guess the date these photos were taken? Consider all that coal smoke. As it turns out Dockyard III doesn’t always blow so much smoke. Click on this link if you wish, but what I find remarkable there is that Dockyard III and its sisters were built in WW2 for Murmansk and hence have the chimney-encasing wheelhouse (for heat) and an ice-strengthened bpw. 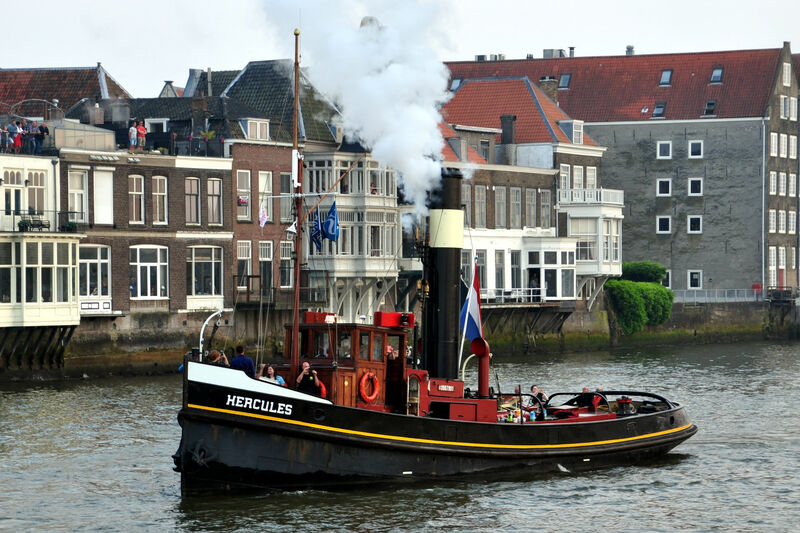 Paddle steamer De Majesteit dates from 1926. 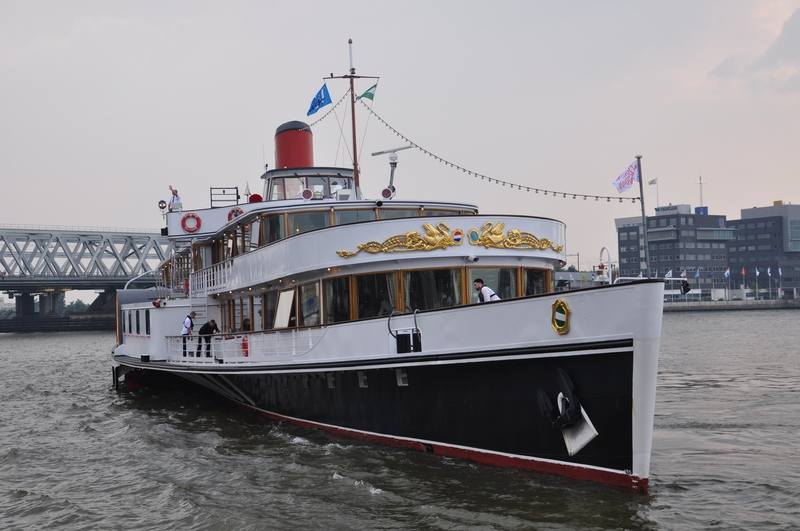 I saw her on the river in Rotterdam in 2014, and included her in a comparison of old passenger vessels here. Dockyard IX, part of that same order that never made it to Murmansk, was completed in 1942. Dockyard IX has been on this blog once before here. 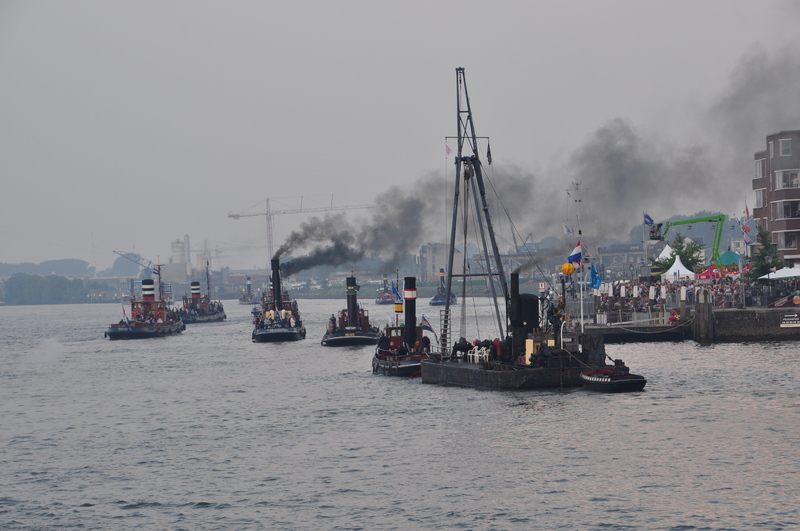 Many steam tugs crowd the river below, but nearest the camera, that’s Heibok 4, a floating steam crane dating from 1916. SS Furie, dates from 1916. I wrote about her extensively here in 2016. 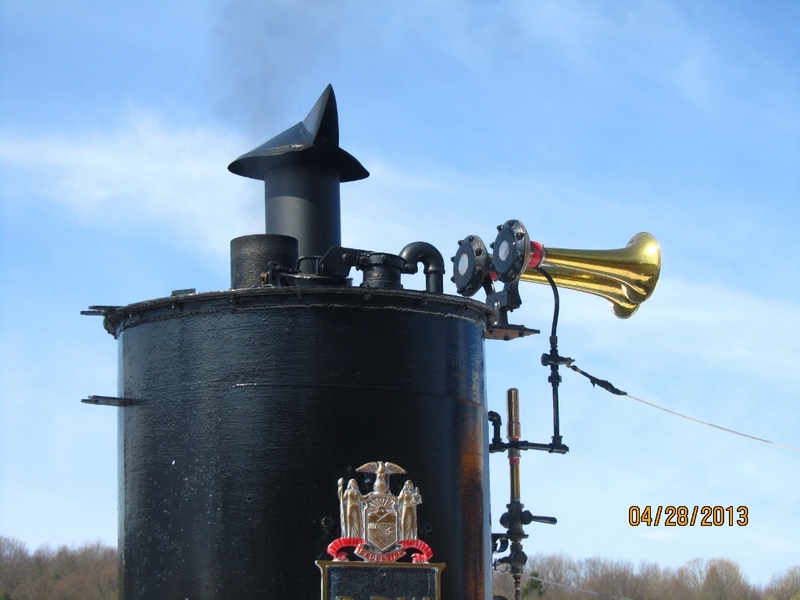 George Stephenson had me fooled; it was built starting in 2007, ie., she might be called steampunk. I saw her in May 2014. Hercules is the real deal steam, launched in 1915. 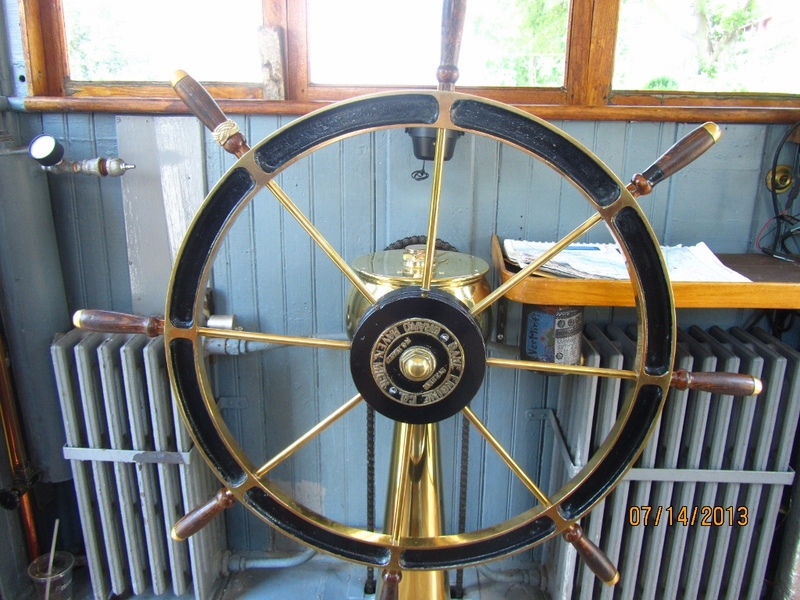 I was aboard her in 2016, as seen here. 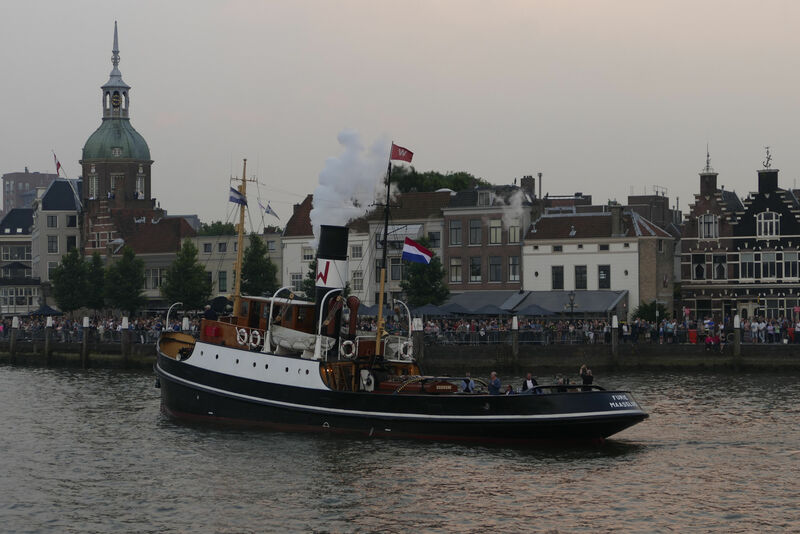 And the answer is late May 2018 at the Dordrecht Steam Festival. The photos come via Jan van der Doe from the photographer Leo Schuitemaker. 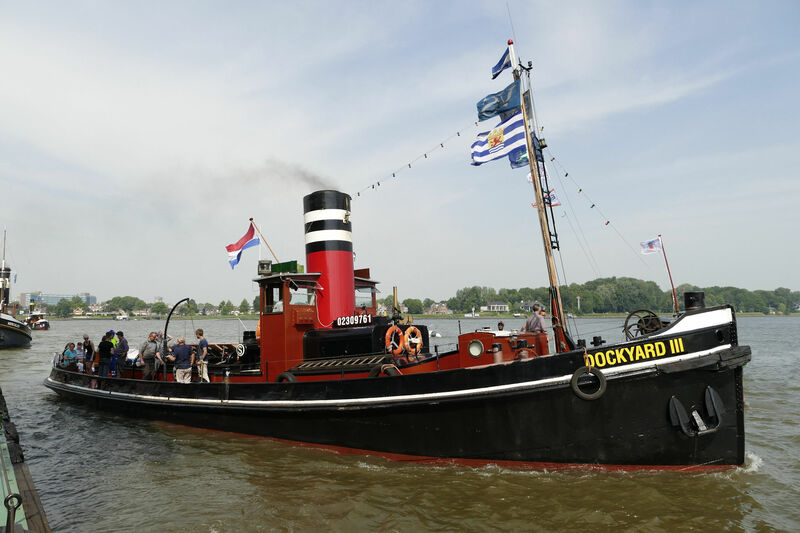 Looking at these photos, I’m again struck by the number of historic vessels preserved and in operating condition in the Netherlands. Some are scrapped there of course. 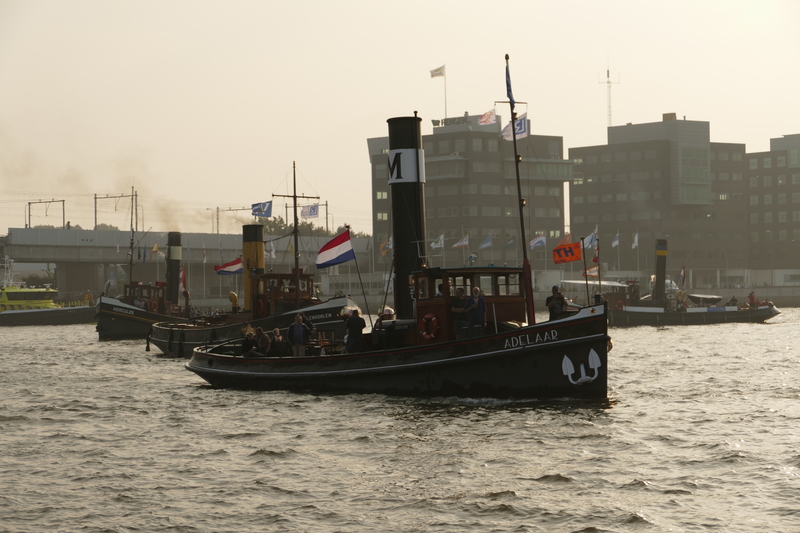 Has anyone ever heard of the Dutch reefing boats to create North Sea fish habitat? These, and I have many others from Jan and Leo I’d love to post, have benefitted from loving restoration. 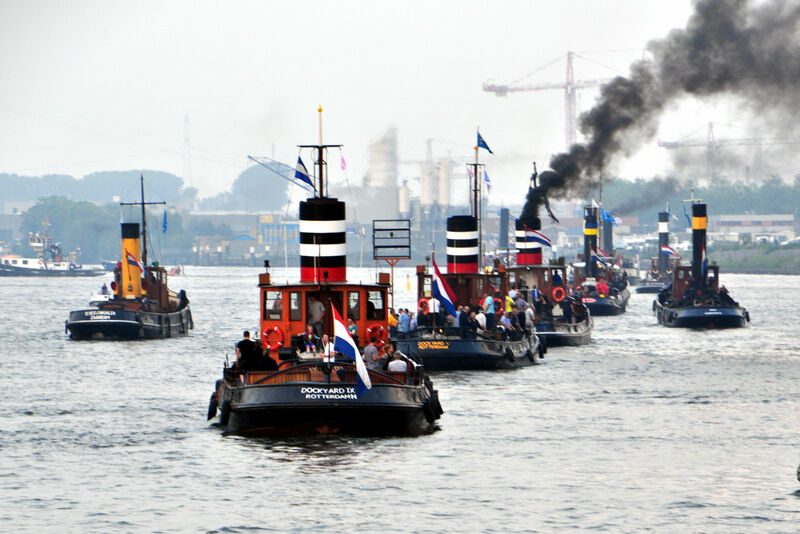 Let me know if you want more steam tugs. Amicitia, which I wrote about in 2011, is back to life after 60 years (!!!) underwater as a result of being bombed, not reefed, back then. Do the Dutch have different financial tools that produces this fruit? Is it because of their different attitude toward maintaining machines and buildings? Are there just different priorities throughout Dutch culture? A google search leads to this article referring to “artificial reefs around the world,” but the headline is quite misleading. Thanks to Steve Wunder for the photo below taken yesterday in Fonda NY. 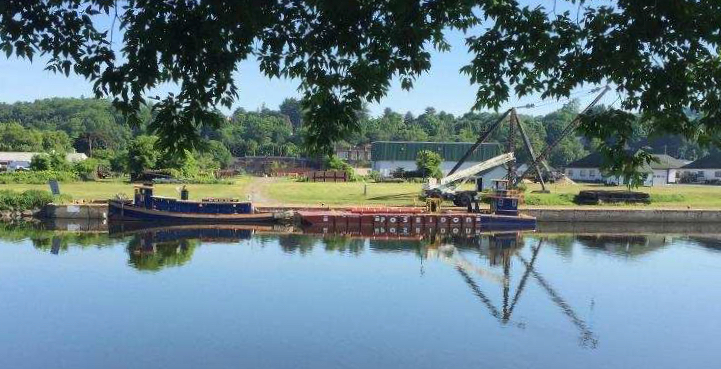 To the right, it’s a new 2018 Marine Inland Fabricators 25′-3″x14′x5′ Clydesdale pushtug, either hull 323 or hull 324. BUT, to the left and much more significant, it’s Urger, a few miles east of where the 1901 (!!) 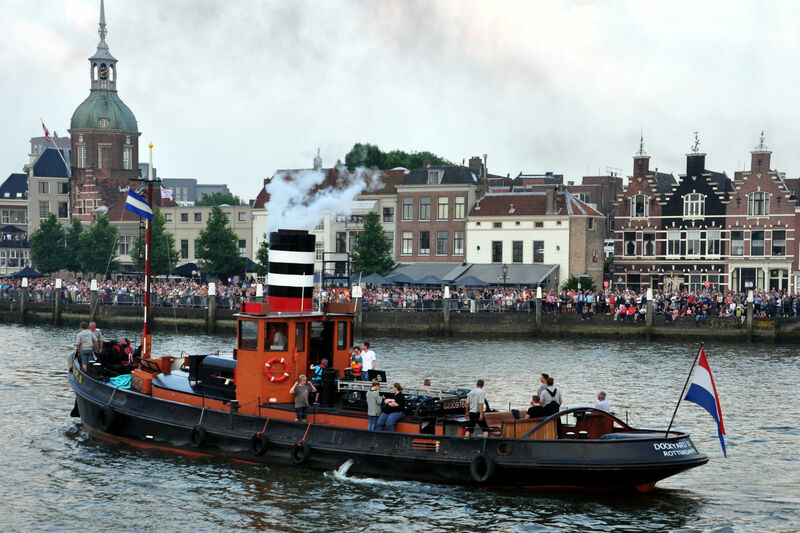 tug is said to be intended as a land display, sans integral hull, i.e., it’ll never float or tour the waterways again. I intend this post as a followup to last week’s here, where I wanted to illustrate what we New Yorkers stand to lose, if this lock 13 park plan gets carried out. In following up, my intention is to underscore our potential loss. 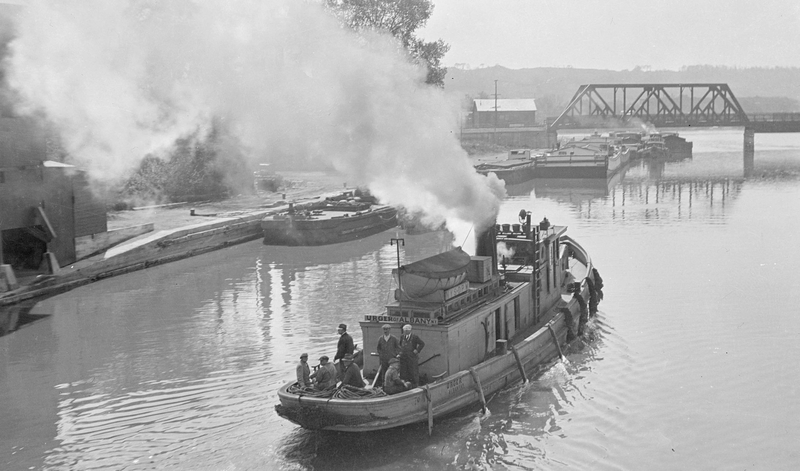 The photo below shows Urger in 1940 in Waterford, operating as a steam tug. 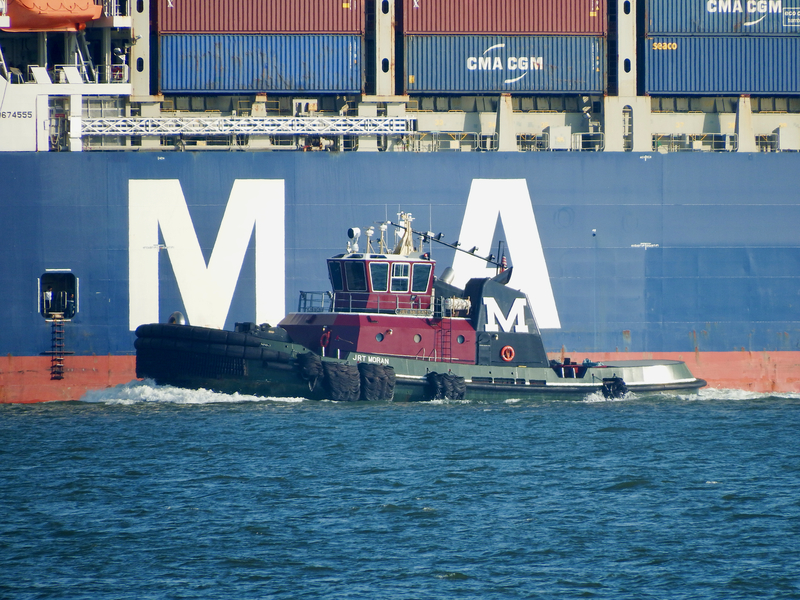 At that point, the tug was already 39 years old. 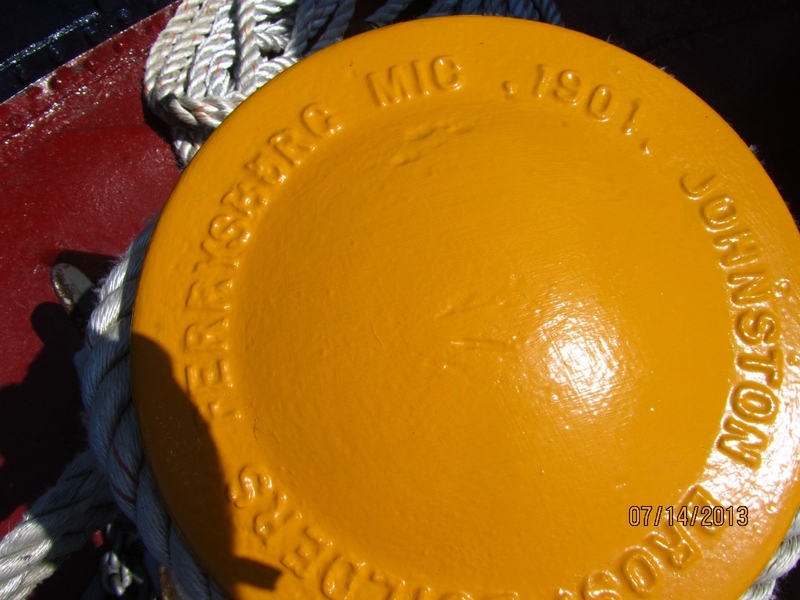 Urger was launched in 1901 as fish tug Henry J. Dornbos, by Johnston Brothers, a fact still visible on the bitt below. The company was founded in 1864 by J. W. Johnston, a direct descendant of the none other than James Watt. The rest of the photos here come from the archives of Bob Stopper, canal ambassador extraordinaire based in Lyons, NY. 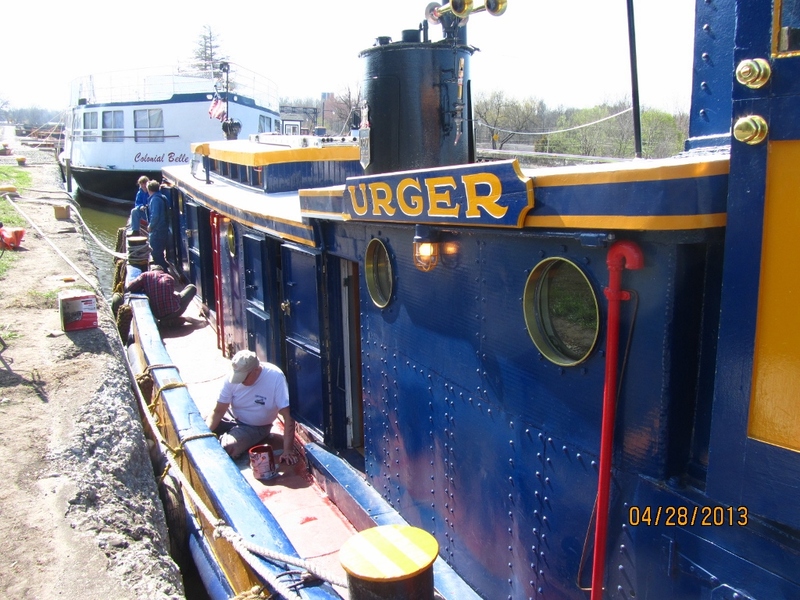 Urger has likely been seen and touched by many more people than any other Canal tug or other New York State symbol, particularly because from 1991 until 2016, it crisscrossed the state’s waterways from May until October, doing programs for 4th graders and festivals for the general public. 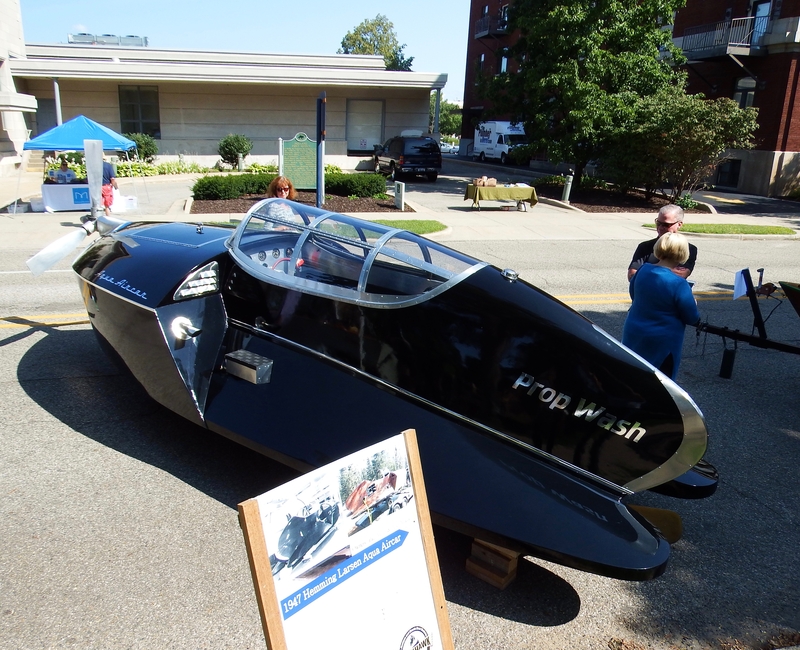 Schools bused kids to the canal parks to learn about NYS history, technology, and the environment. Before any program, crew cleaned, painted, and polished. Think about 1901. Life expectancy for US men was 47.6 years, and for women, 50.6! Companies like Harley Davidson and Ford wouldn’t form until 1903, also the year the Wright Brothers made their first flight. There were 15 automobiles registered in the 45 states of the US, where the population was all of 75 million; Utah had been the last state to enter the union in 1896. The world’s tallest building was Philadelphia City Hall at 548.’ US Steel had not yet been created, and Standard Oil would go another decade before being broken up. RMS Cedric was the world’s largest ship, and Titanic was not even on the drawing board. The US was involved in a shooting conflict in China. 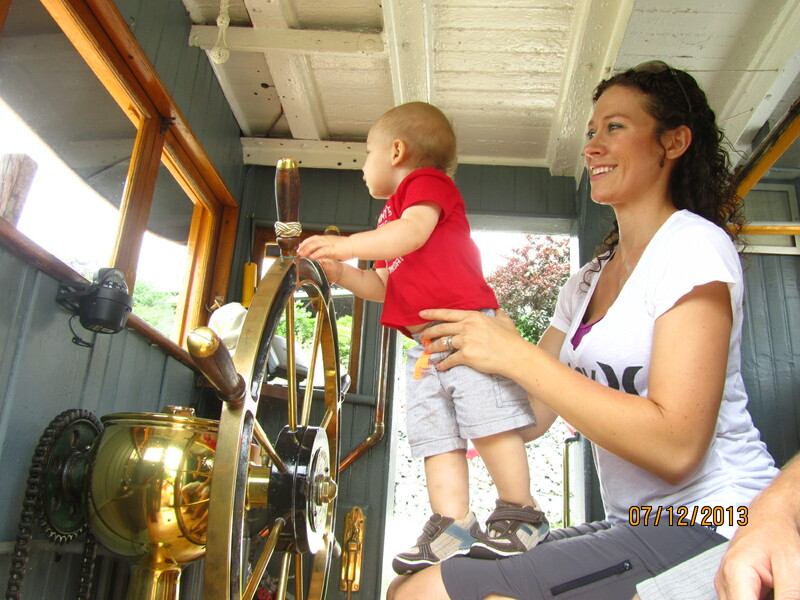 Literally thousands of New Yorkers of all parts of the state and ages have benefitted from Urger at a canal port near them, like this future mariner. Time is critical here. 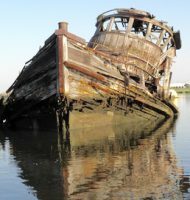 Unless minds get changed, we could be days or even hours away from Urger‘s life as a boat permanently sunk, which IMHO, would be a significant loss. Please share this post with friends, local schools, and other networks. Also, contact your federal, state, and local political leaders. Click here for most of my previous Urger posts. 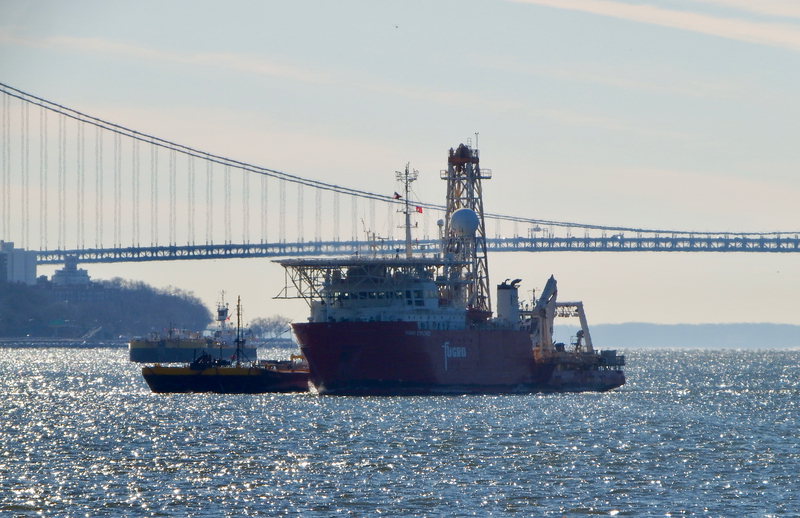 After 66 days at sea, Zhen Hua 20 dropped anchor in Gravesend Bay yesterday after a few hours after I departed. But thanks to Bjoern of New York Media Boat, this phase of the visit has been documented. Note the Miller’s Launch crew boat off starboard bow. 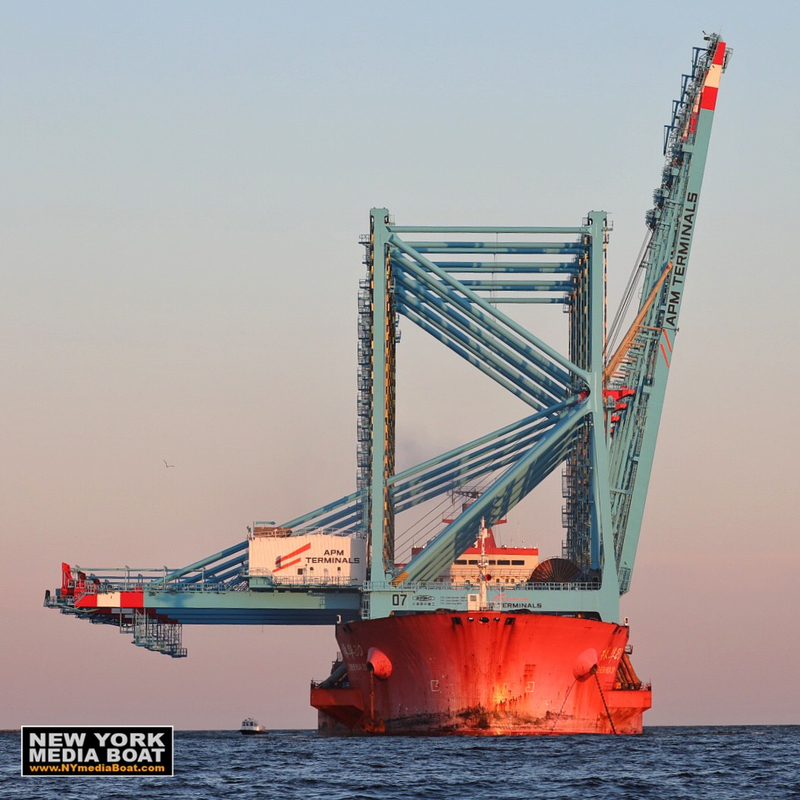 Booms must be lowered before the delivery will fit under the Bayonne Bridge on the transit to Port Elizabeth . . . alter this week. Many thanks to Bjoern for use of these photos. 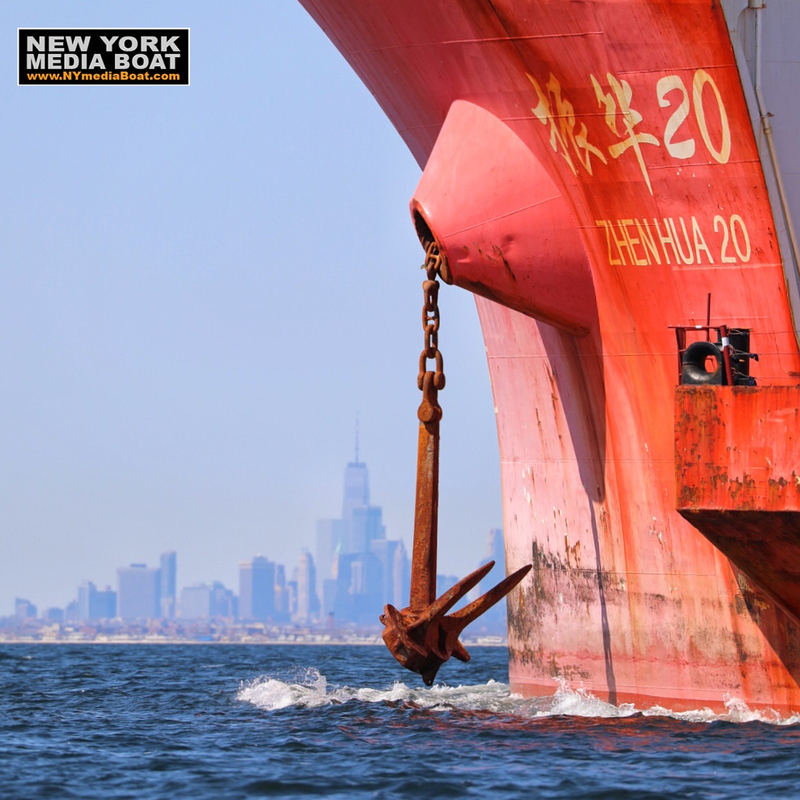 For more info on New York Media Boat–actually there are several vessels–check them out online or see and “like” them on FB. 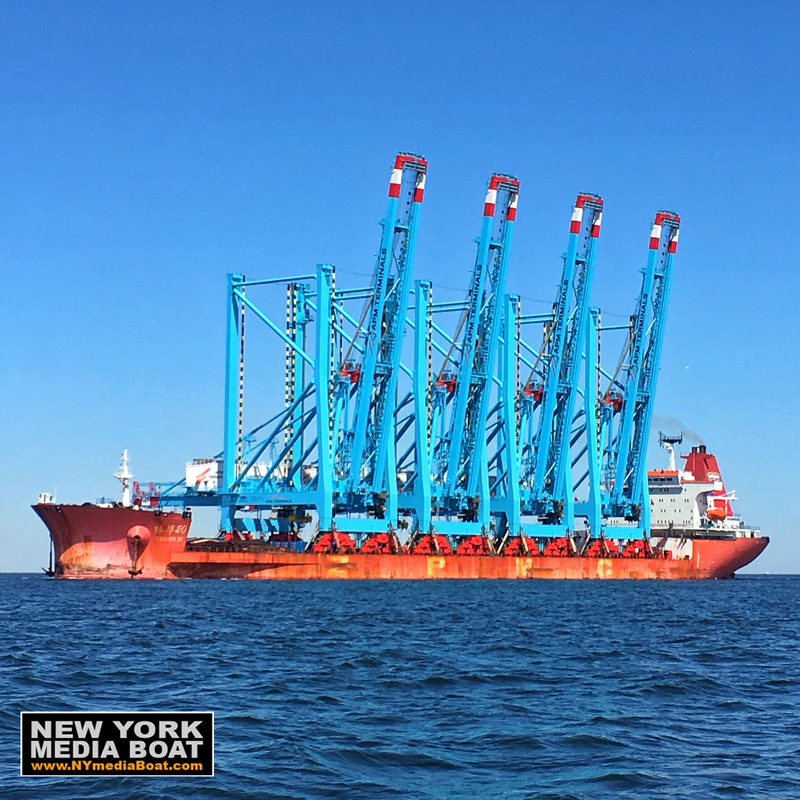 Here was a Zhen Hua vessel in port back in 2007–the first I ever saw–from 2008 here, and from 2014 . . here, here, and here. Marginally related: One would not need these cranes at one point in the Comoros; this practice I’ve read has ended. 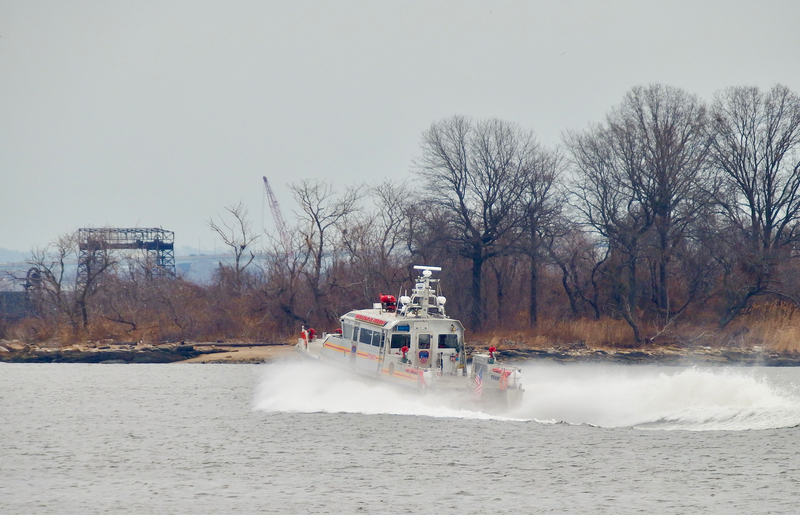 Some government boats have jet drives. In this post from early September 2014, the smaller vessel had jet drive, whereas the larger one–propellers, although I can find no info about , eg, their diameter. 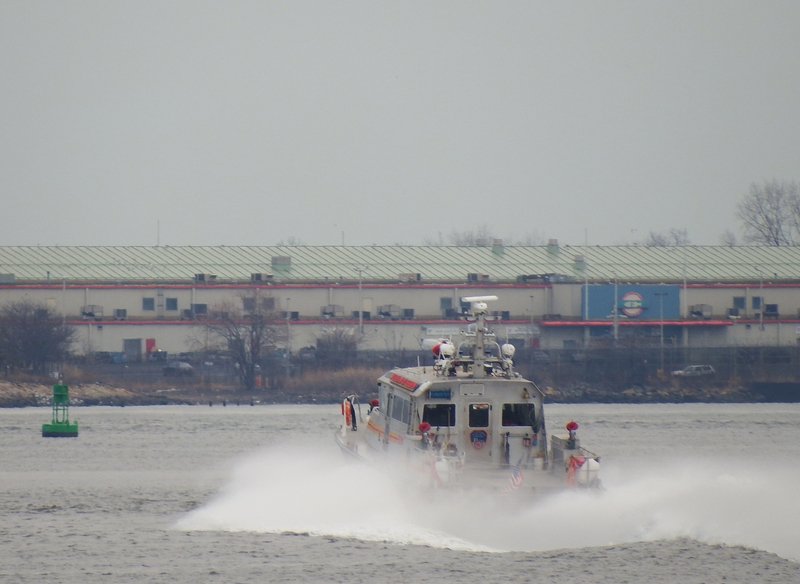 The other day in the East River I encountered FDNY’s newest (?) vessel, William M. Feehan. Click here for Feehan‘s dedication in the sixth boro. Feehan‘s 3450 hp, generated by three Caterpillar C-18 engines, gets propelled by three HJ 403 Hamilton jets. Speeds are slightly faster in fresh water, but both fresh and salt water need to be in liquid state. USS Little Rock‘s 96,000 hp are to no avail when water converts to solid state, even with just some chunks of solid, because of the otherwise highly desirable waterjets. 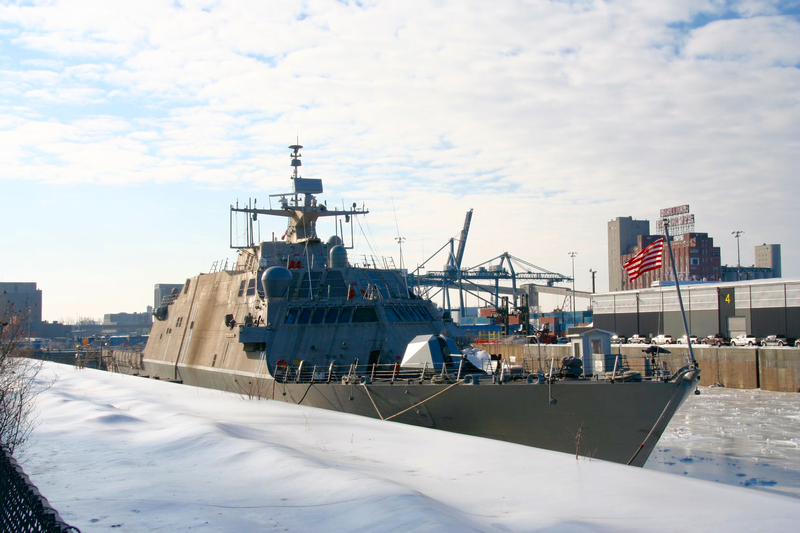 For complete specs on USS Little Rock LCS-9, click here. The photo above comes via Marc Piché and was taken by René Beauchamp. All others by Will Van Dorp. A different post was scheduled for today, but when good fortune smiles, I smile. 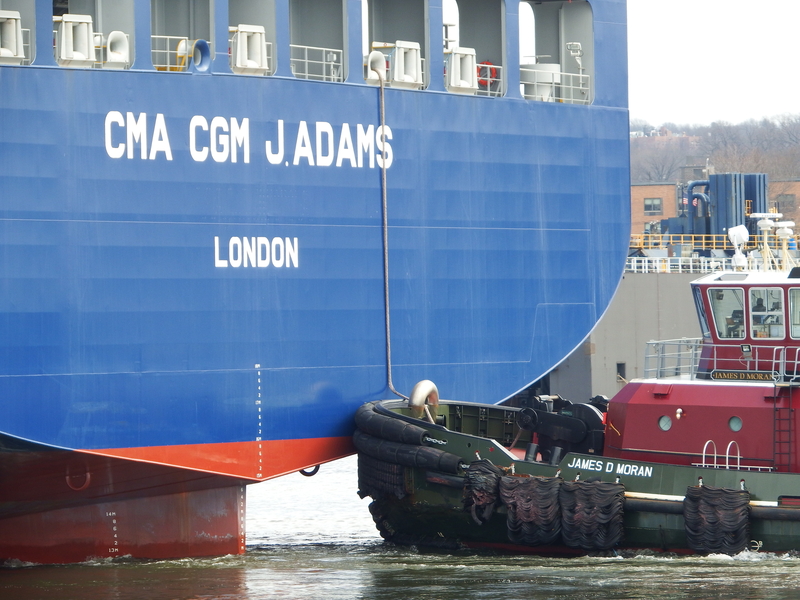 Behold J. Adams bound for sea, as she could not have a year ago . . . in fact, she may very well not even have been completely fitted out a year ago. 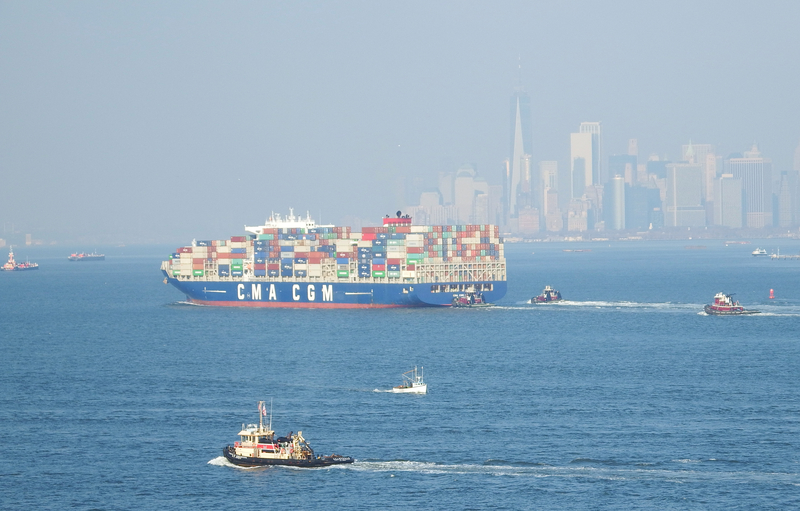 As of this writing, I believe that J. Adams and T. Roosevelt are the only two of CMA CGM’s 14,414-teu vessels calling in the sixth boro. 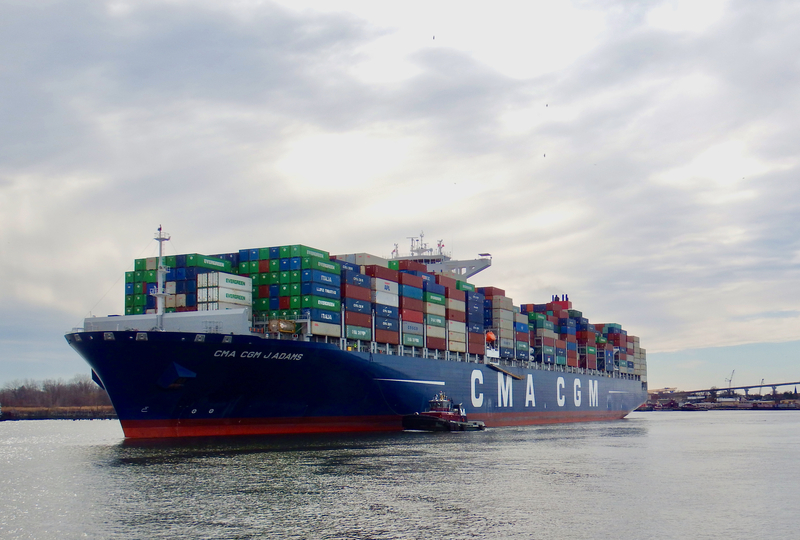 CMA CGM has just launched a 20,600 tee vessel, not scheduled to call here. I’ll smile even more once the walkway on the bridge opens, allowing photos from a different perspective. 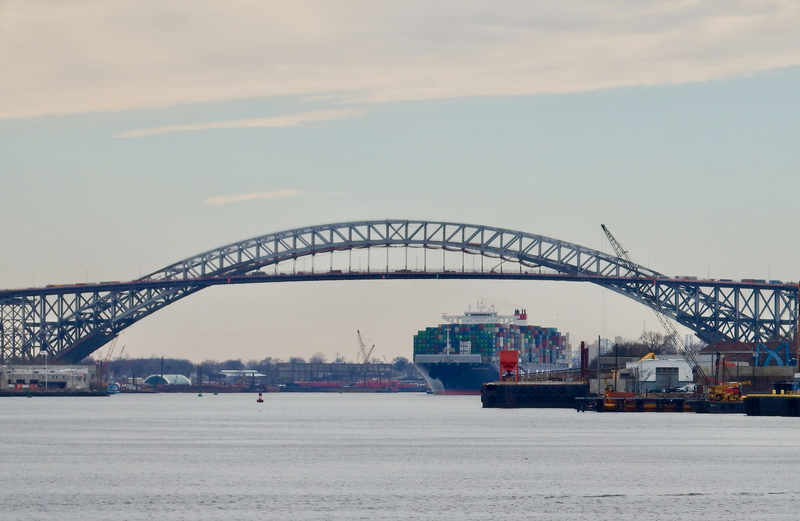 Such a change in capacity from the vessel carrying the first containers outbound from the sixth boro back on April 26, 1956! 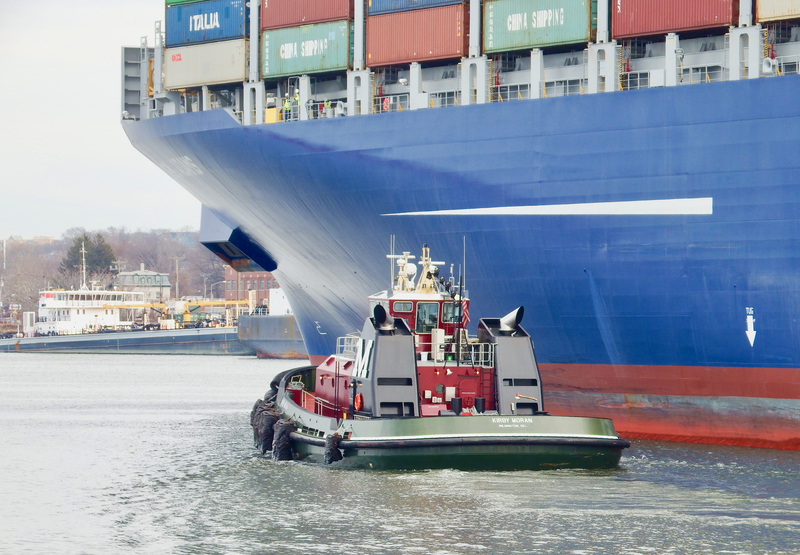 This tech spec sheet starts out with an interesting graph of vessel capacity since 1980, and much more. 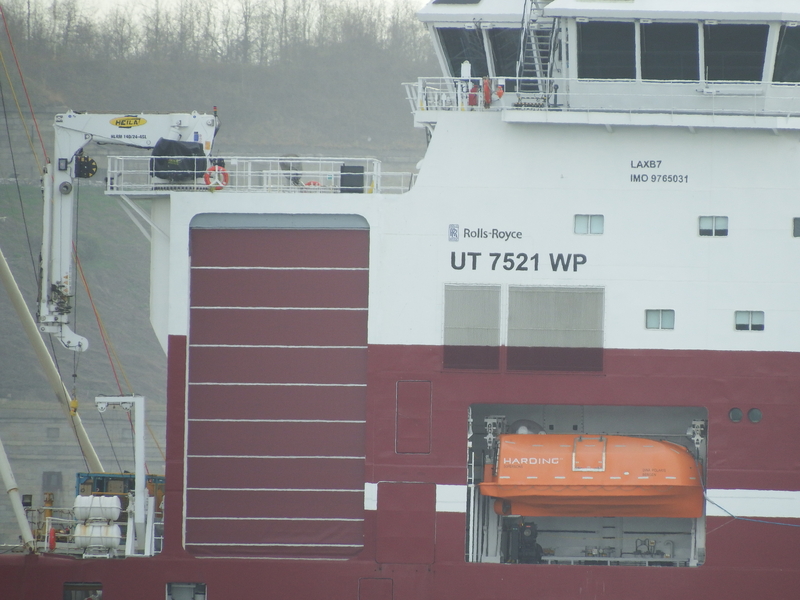 Kirby Moran (6000 hp) looks small here, and notice the two bow thrust symbols on the bow, which–if I interpret this info correctly–operate with 5000 hp. Captain D and her trash barge provide some sense of scale here. 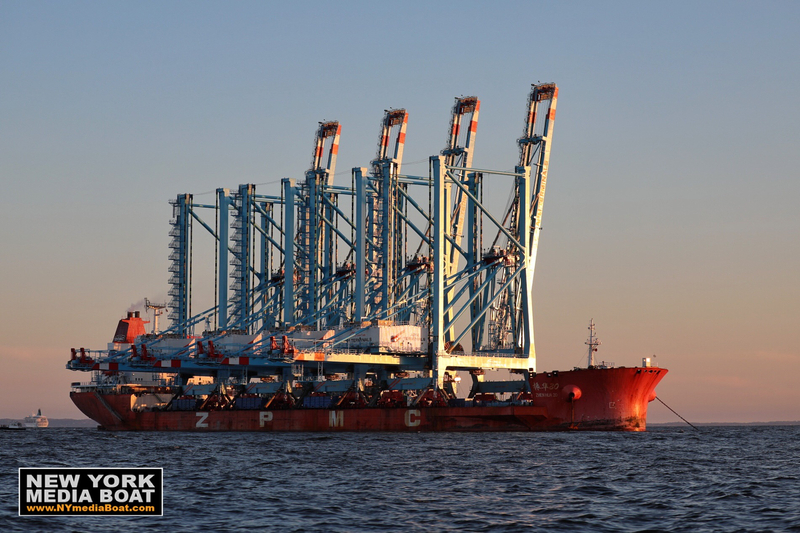 For cleaner port air, she’s equipped with an HVSC by Wärtsilä , which also provides the propulsion power. 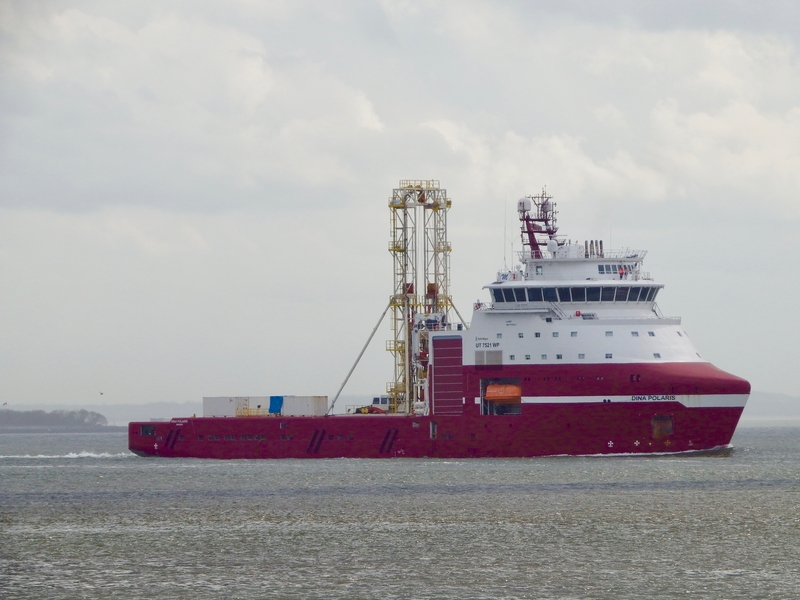 Kirby Moran–work on this vessel complete– heads back to sail the next ship out of port. Following are James D and JRT. 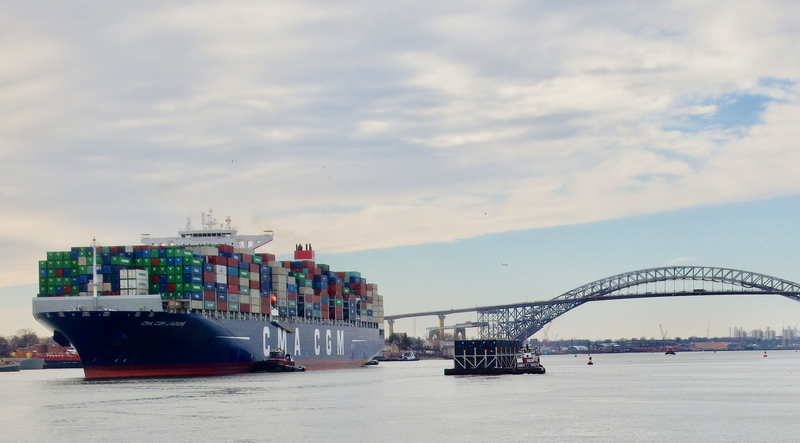 I don’t know the calling ports for the other two 14,414 teu vessels: A. Lincoln and T. Jefferson. Here are the previous posts in this series. So what is this? 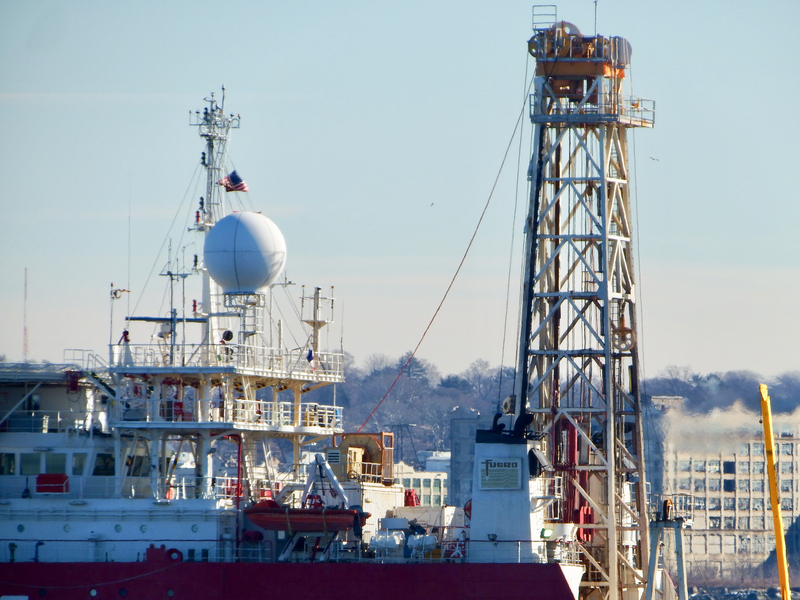 It’s an ultra deepwater geotechnical drilling vessel. 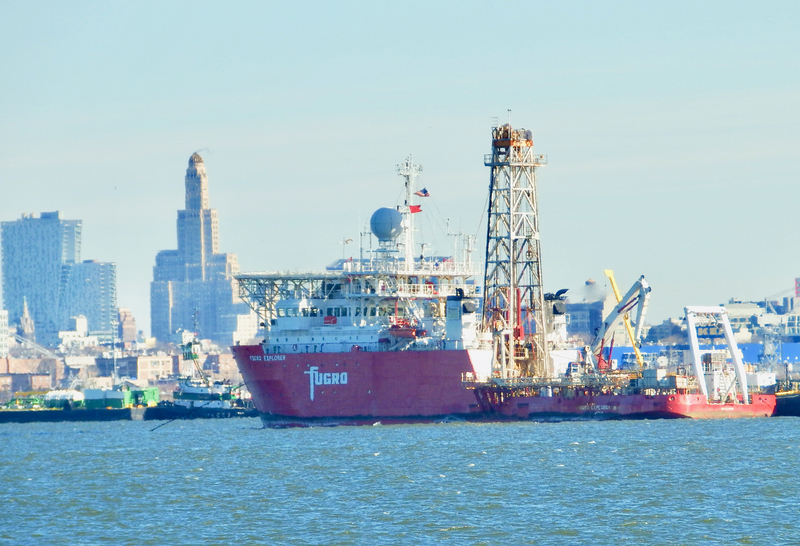 It’s not drilling in the Upper Bay . . .
although it has the gear to do so. 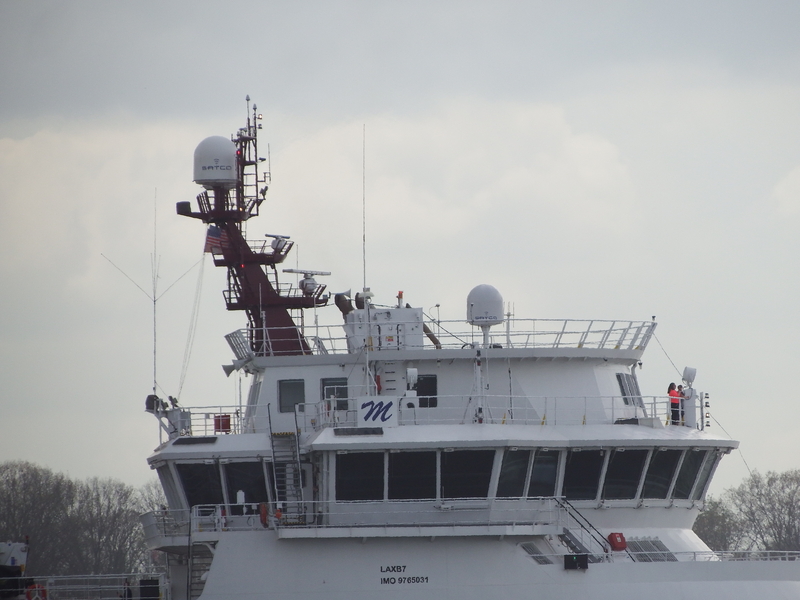 With that helo pad above the wheelhouse, it looks to be what is associated with ports like Rio and Fourchon. 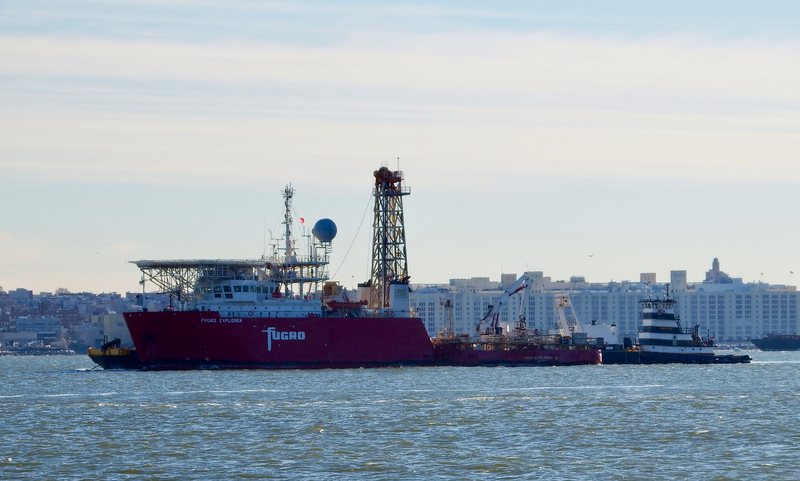 Above Fugro Explorer takes on fuel from Emerald Coast. 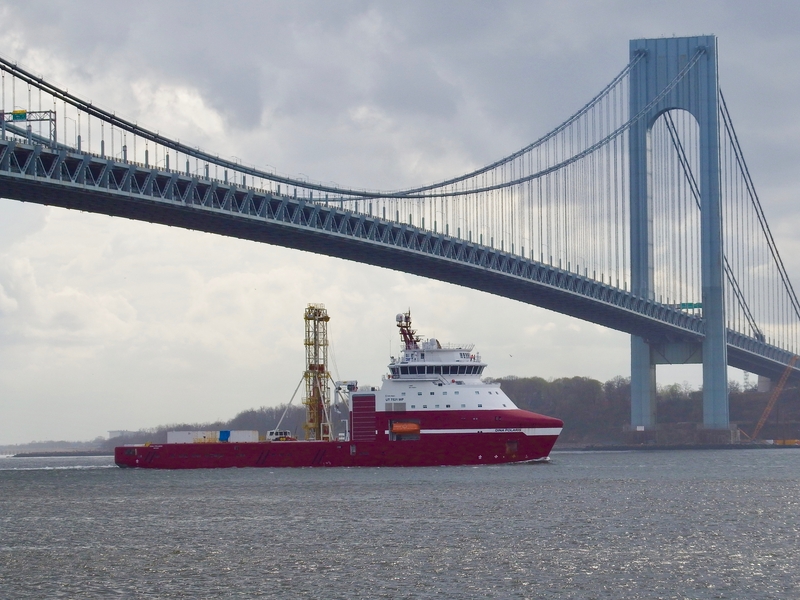 I was fortunate to get these photos–she’s been in and out of the harbor several times in the past half year–before she made through the East River bound for New Bedford, where she has now arrived. 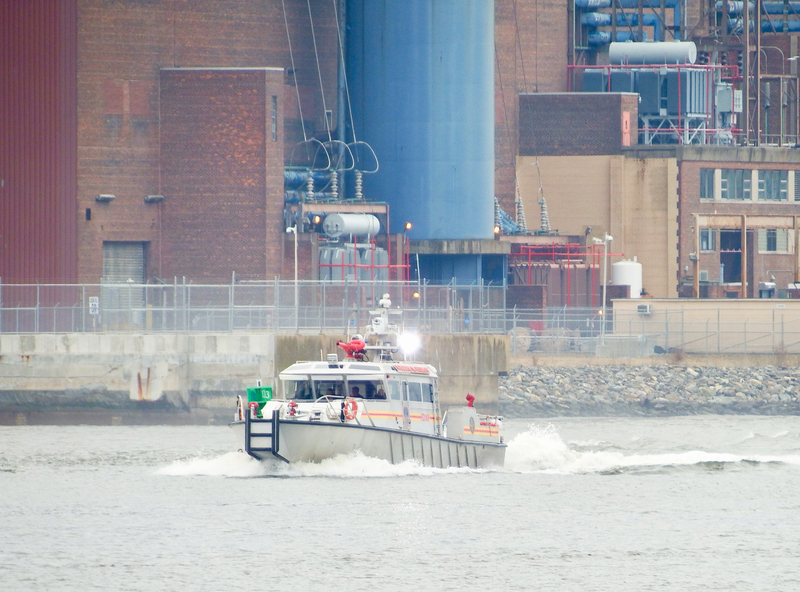 She would have been a sight to behold on the East River, but omnipresence is not easy to manage, even in our sci-fi 2018 world. 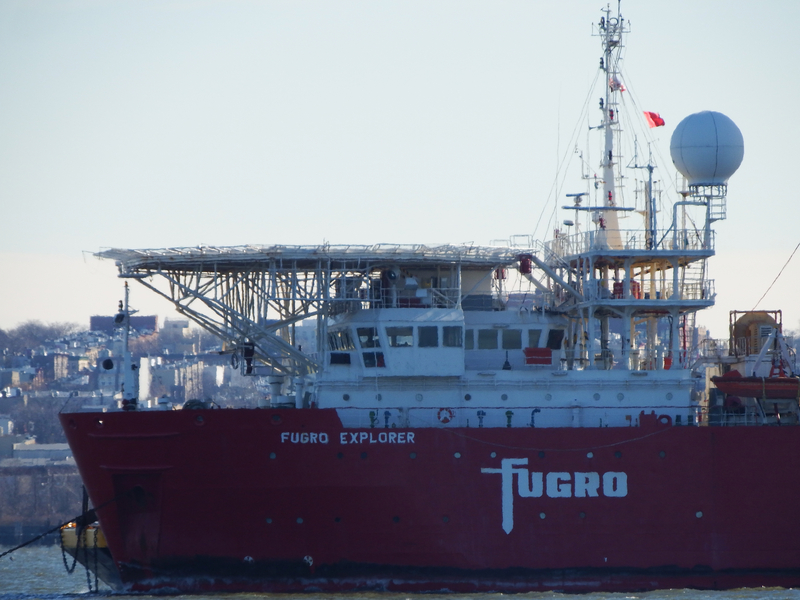 Here’s more on Fugro, “Ingenieursbureau voor Funderingstechniek en Grondmechanica.” Fugro provided one of the vessels involved in the search for Malaysian Airlines Flight 370. 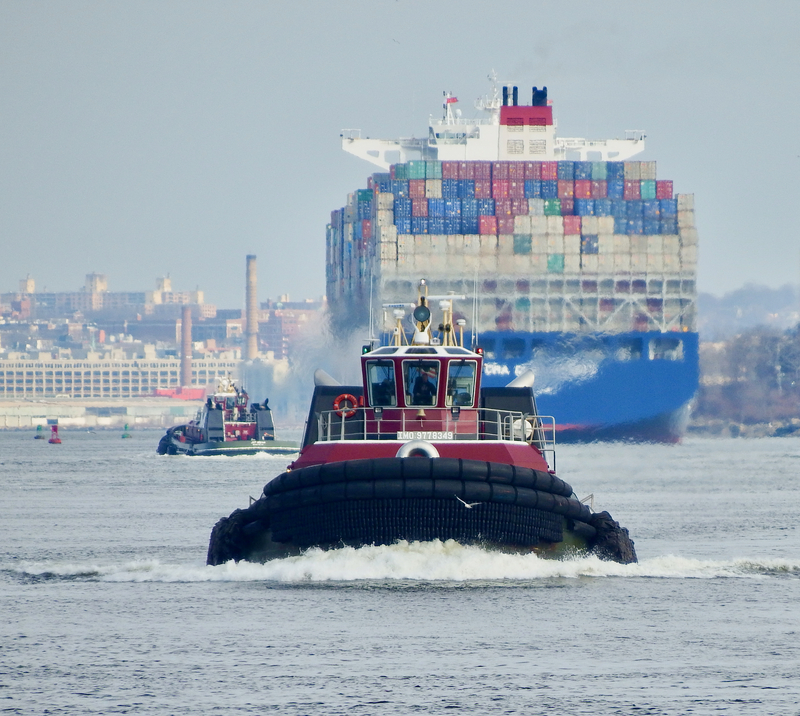 I first used this title seven years ago, and a comparison shows how much things have changed: some box ships “dead”, tugs modified and moved around, and the Bayonne Bridge clearance now above 151′. 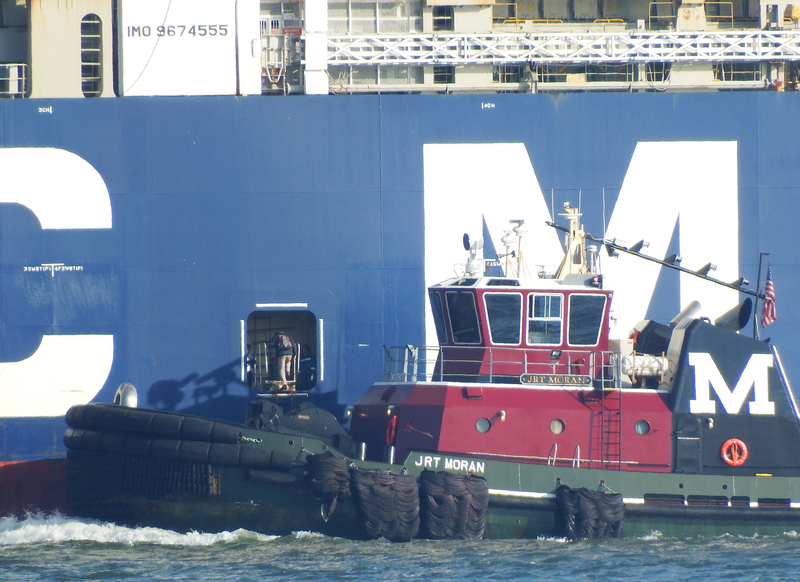 Two of the three tugs waiting for Tage were James D and JRT, both 6000 hp tugs probably not even on the drawing board back in 2010 when the first post by this title was published. 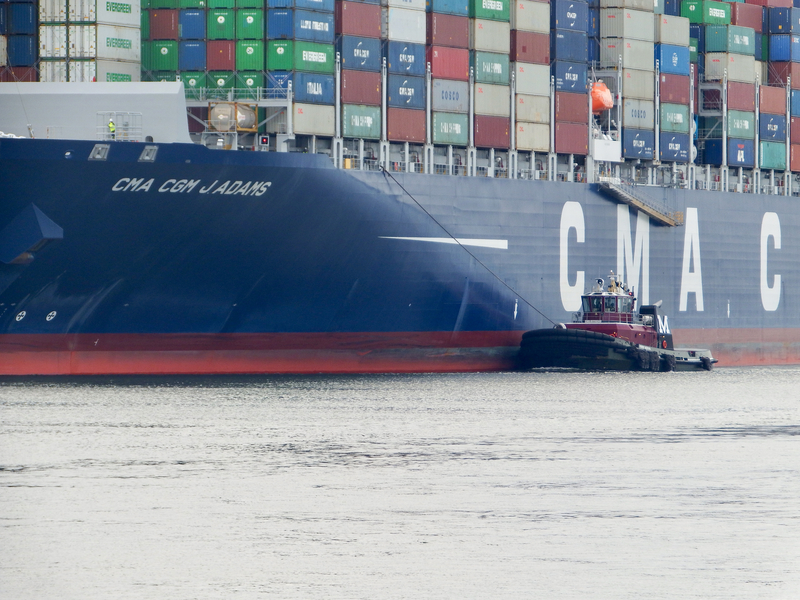 Although CMA CGM Tage has the same midships bridge design as CMA CGM Roosevelt, she is considerably smaller, large though she is. 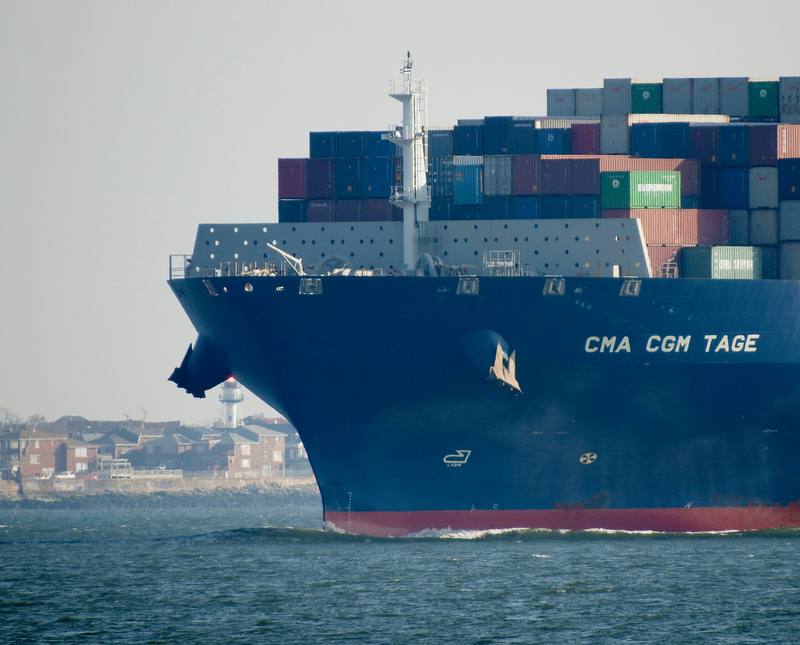 Tage has 9365 teu capacity compared to Roosevelt‘s 14000+. Roosevelt first called here in September, and is currently back on the East Coast. 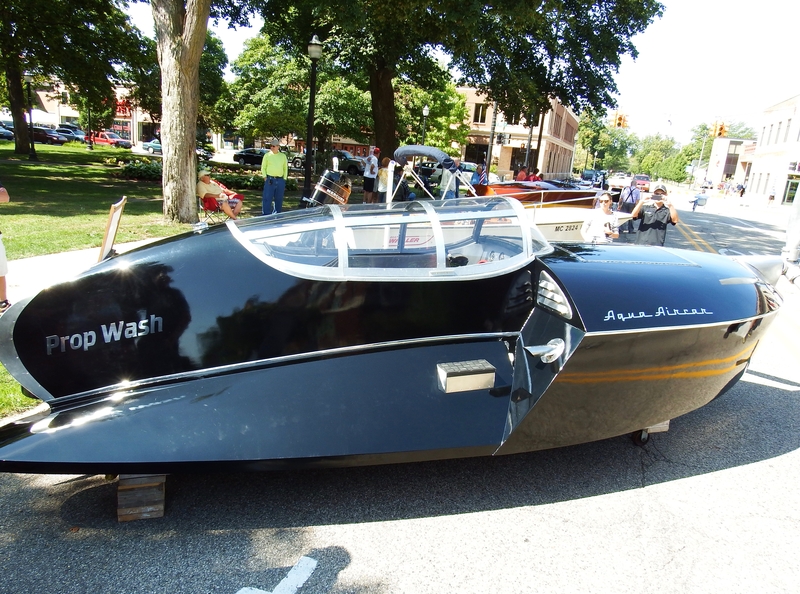 I missed that event because of a Great Lakes gallivant. 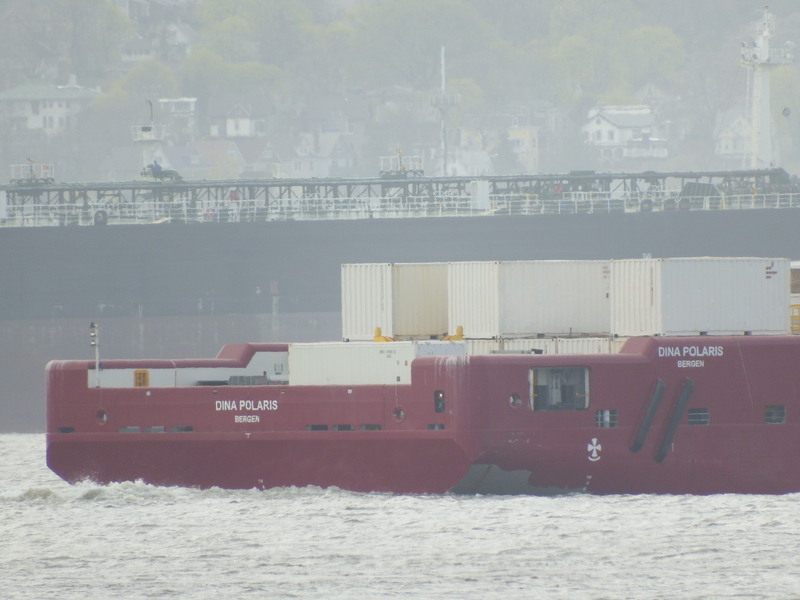 Note the next box ship a few miles behind her in the Ambrose Channel. In fact, five in a row lined up. 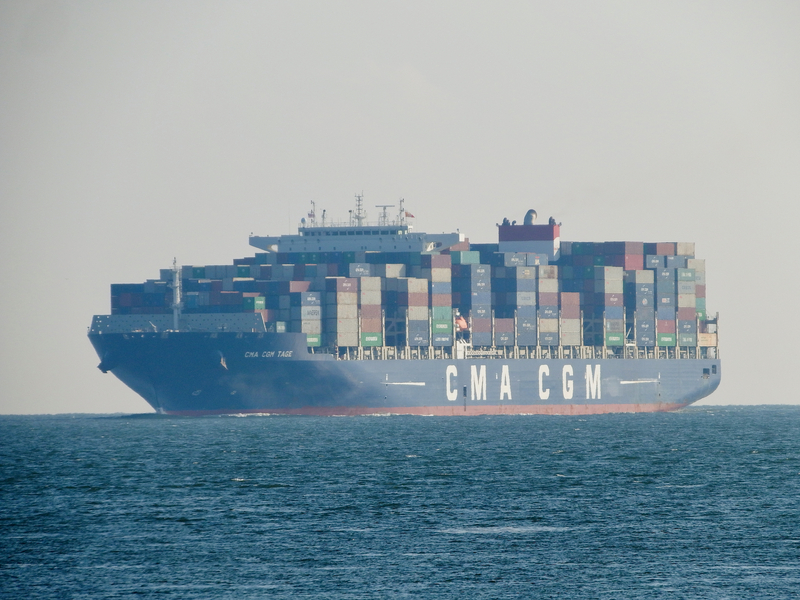 Compared with CMA CGM Roosevelt, Tage is 200 feet shorter. 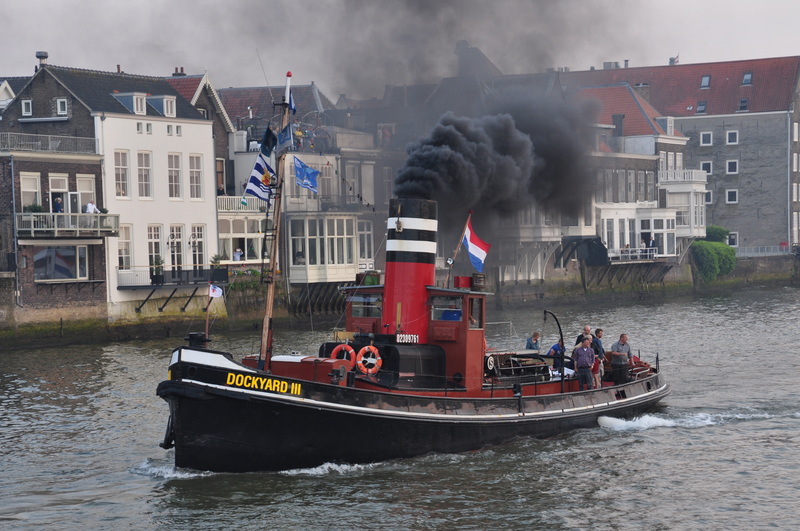 The third tug on this arrival is Miriam Moran. Comparing the photos above and below–same shot wth different cropping–you can see some of what else was in proximity. 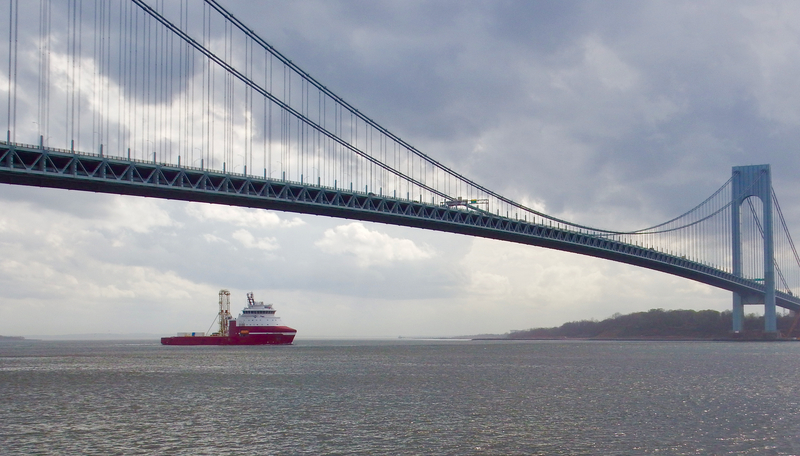 All photos by Will Van Dorp, who wonders when the Roosevelt will return (she was here again in November) or the next even-bigger ship comes in and eclipses Roosevelt‘s record. 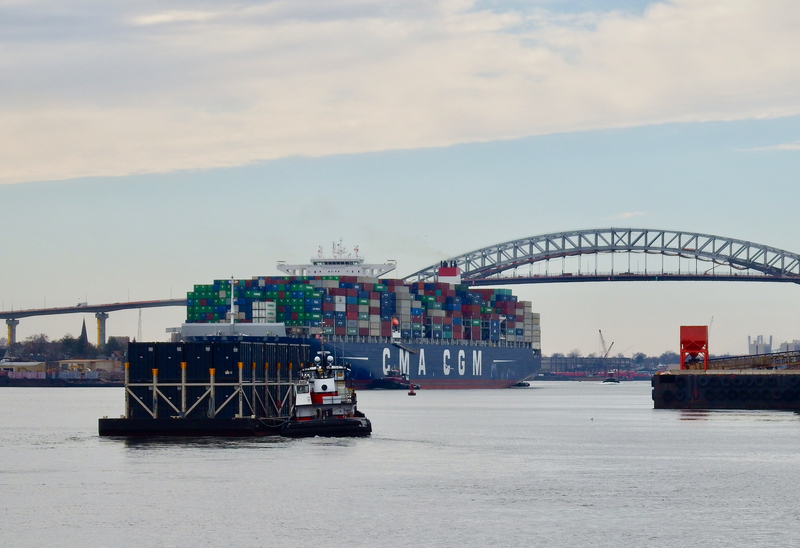 Actually last night a 14,000-teu Cosco Glory –same size as Roosevelt–was escorted into Port Elizabeth. 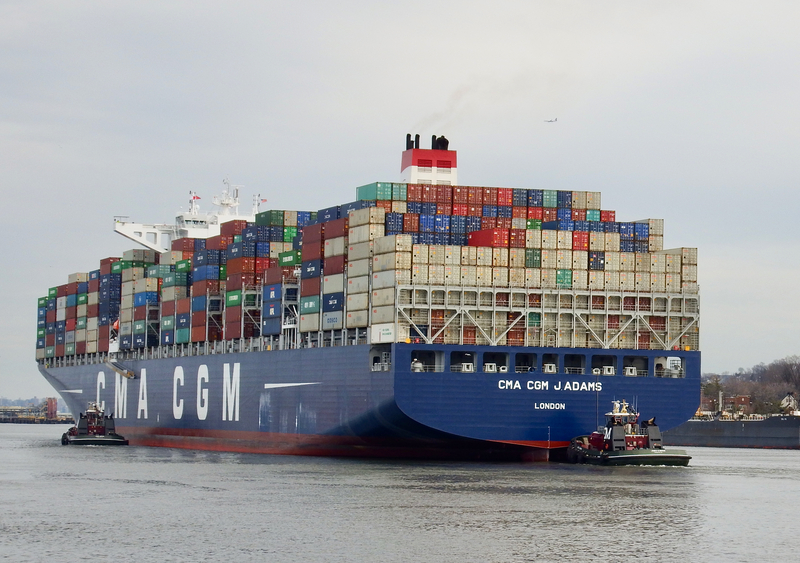 Anyone know CMA CGM Tage‘s namesake? Really different? This is what happens when your klompen dance gets too spirited. 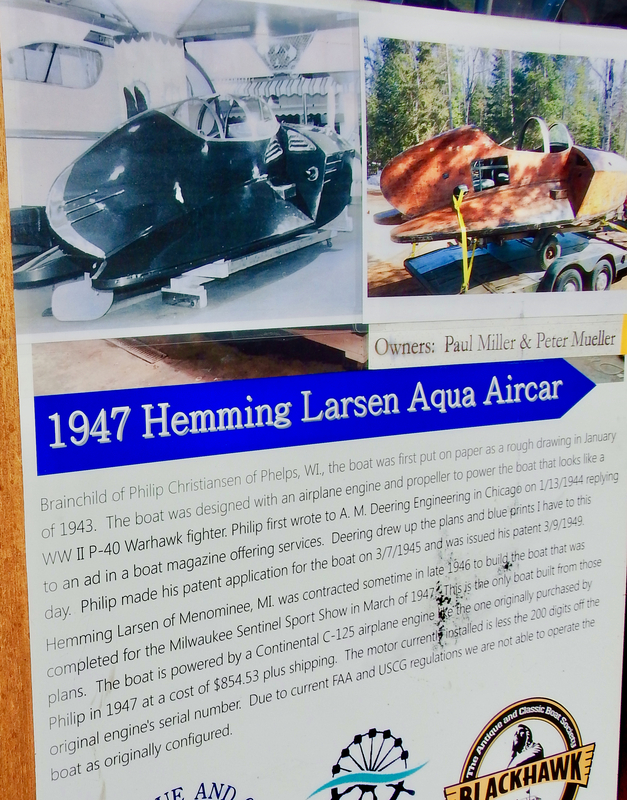 Nearby, I’d never seen anything like Aqua Aircar called Prop Wash . . .
Here’s the Continental C-125 engine. Here’s a video clip showing it under way in the 1950s. 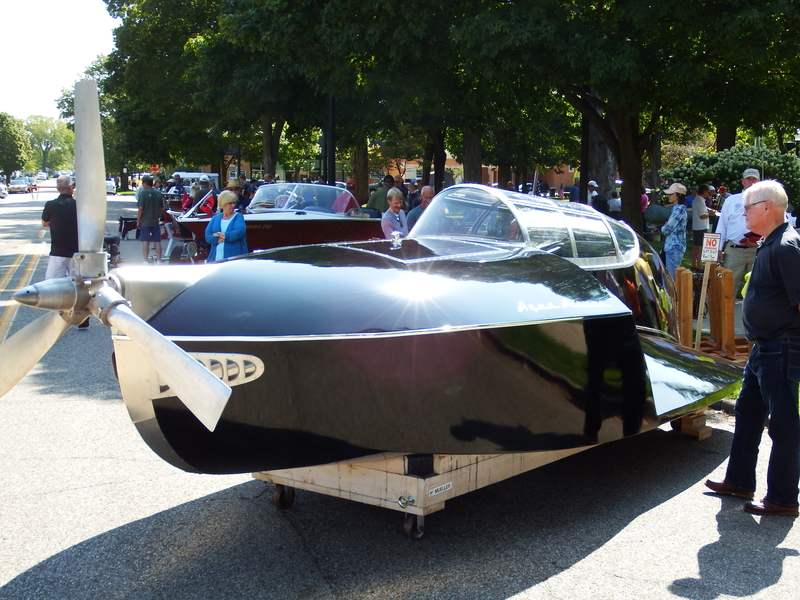 It was entered in an antique boat show in Holland MI. Photos by Will Van Dorp.